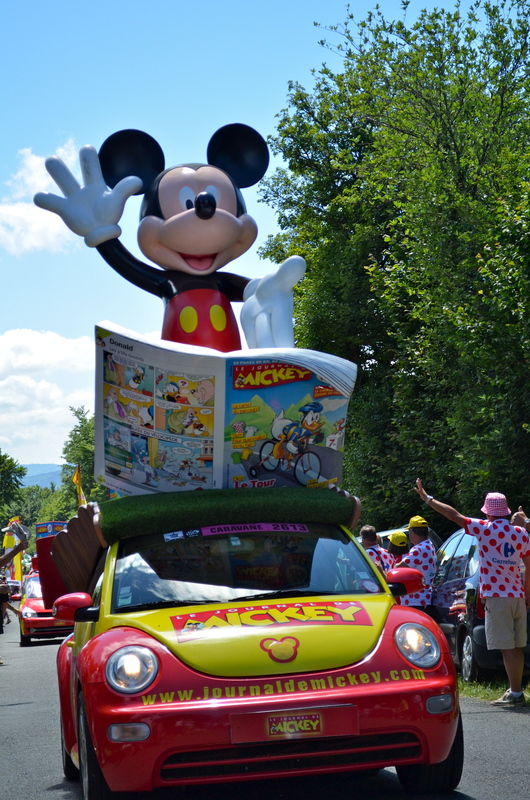 I know that I have posted a lot about the Tour de France. 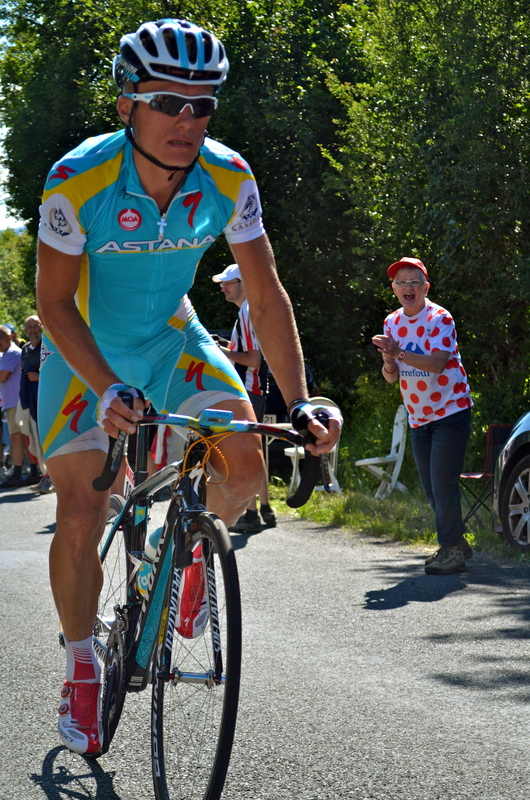 I love it and know that my fellow cycling friends would be disappointed if I didn’t post some pics of the big riders. 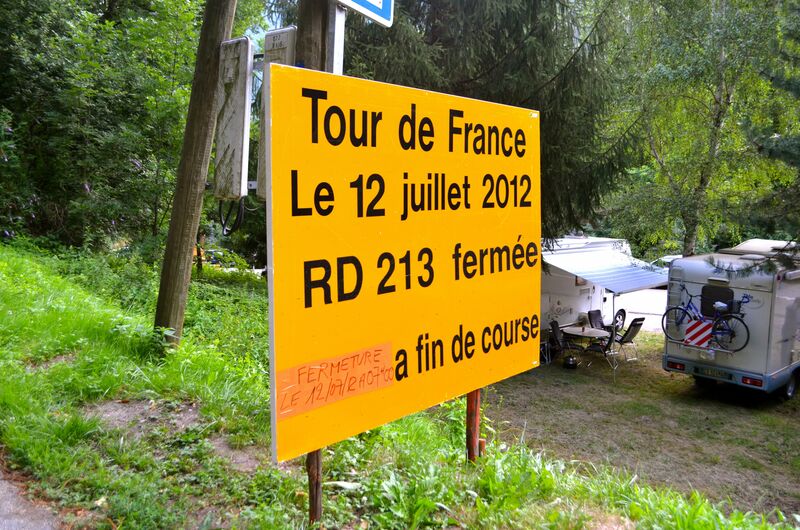 If you aren’t a cycling fans, we’ll be back to normal programming tomorrow as the Tour ends. Feel free to notice the slender arms and the shaved legs. I like that I was able to get this close to the riders. Above is Marcus Burghardt of BMC. 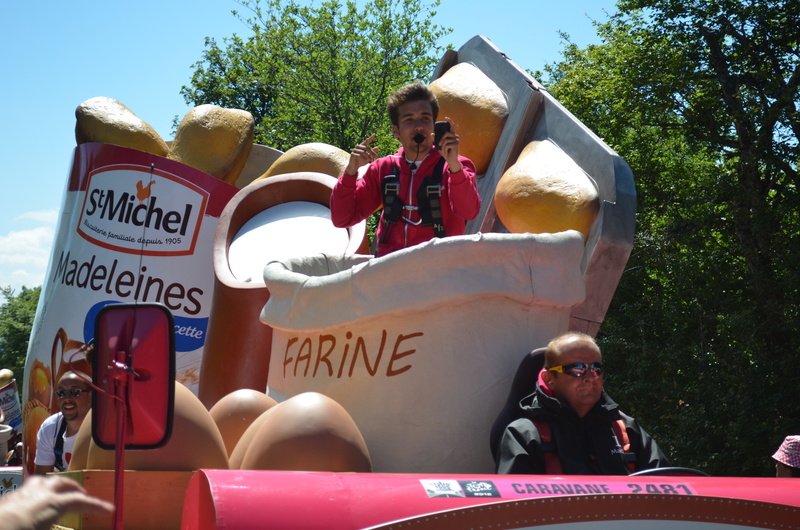 Sandy Casar of Francaise Des Jeux (FDJ is sponsored by the French lottery) is below. Cadel Evans (BMC) with Janez Brajkovic of Astana, Vincenzo Nibali of Liquigas Cannondale, and Alejandro Valverde of Movistar. This is Chris Horner of Radioshack-Nissan. I like that he looks like he is having a good time. “Non-flush urinals are good in theory, but every time I use one it wreaks of week old stale piss. And that is my 1000th tweet.” Words to live by. Big George Hincapie of BMC a cycling legend from neighboring South Carolina (who married a podium girl) and is retiring after this season. 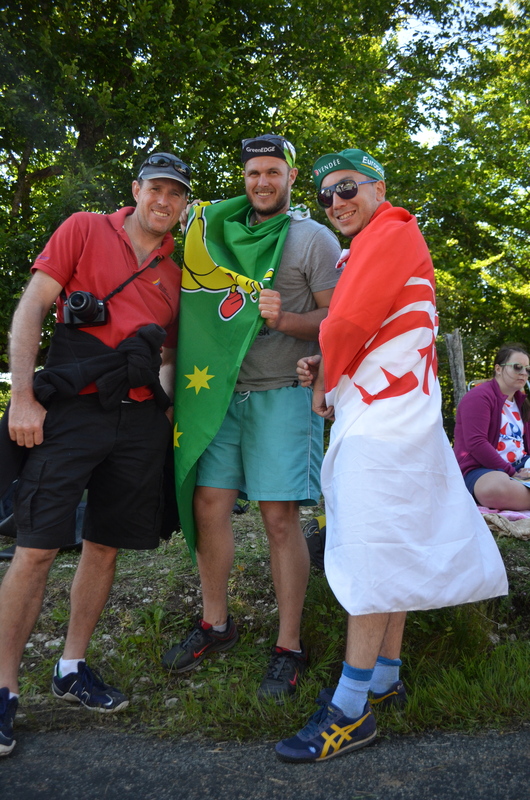 Our Norwiegan friend cheered on the Norweigan National Champion Edvald Boasson Hagen. In case you were wondering whether to address him as Mr. Boasson Hagen or Mr. Hagen, he said, “In my passport it says Hagen as a surname, and Edvald Boasson as first names. Boasson is a kind of middle name. But I prefer to use both as a surname.” If you are still confused, you could try calling him Eddie Boss instead. 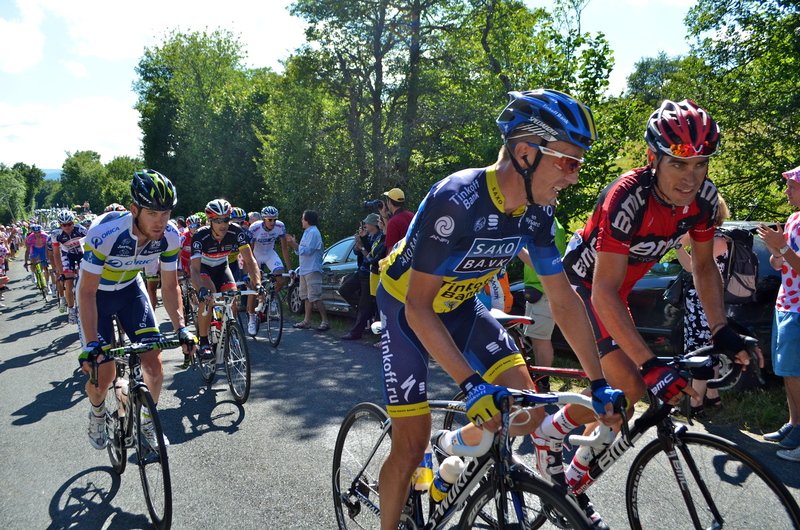 Nicki Sørensen of Saxo Bank-Tinkoff and Manuel Quinziato of BMC (I think) having a bit of a chat. 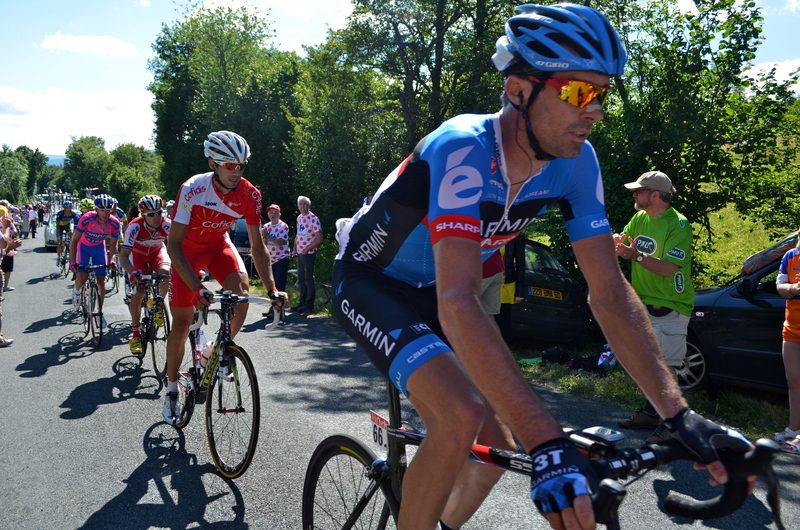 Christian Vande Velde of Garmin-Sharp (gotta love a Chicago boy of Belgian descent). 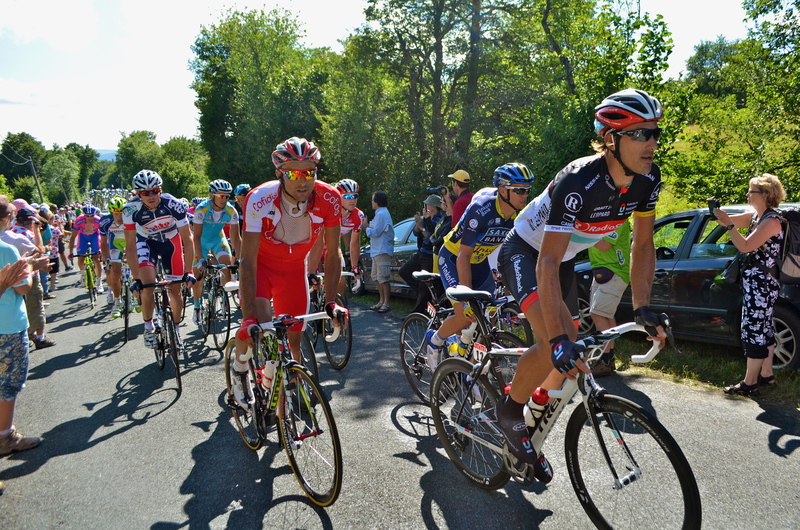 One of my favorite Swiss, Fabian Cancellara, who abandoned the tour after this stage. He plans on competing in the Olympics, but before he does, it is his wish to be present and there for his wife at the birth of their second child. Aaawwww. What a sweetie. So You’re On A Mountain For The Tour, Then What? 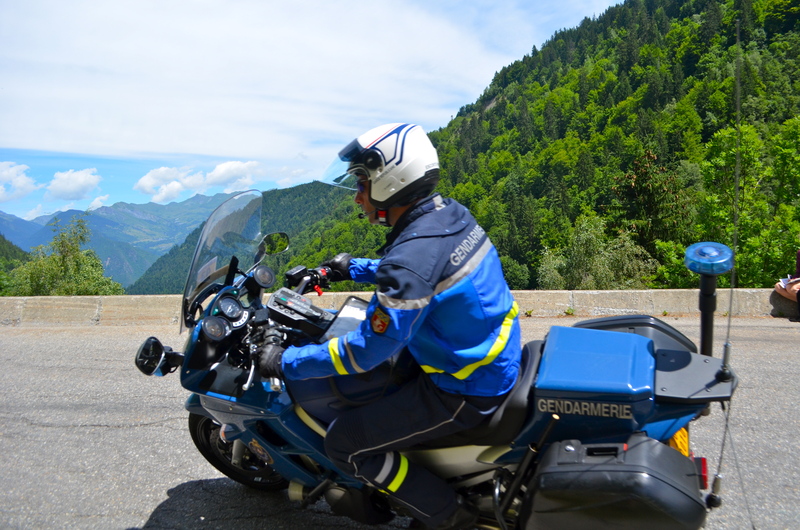 Gendarmes are the French Police. 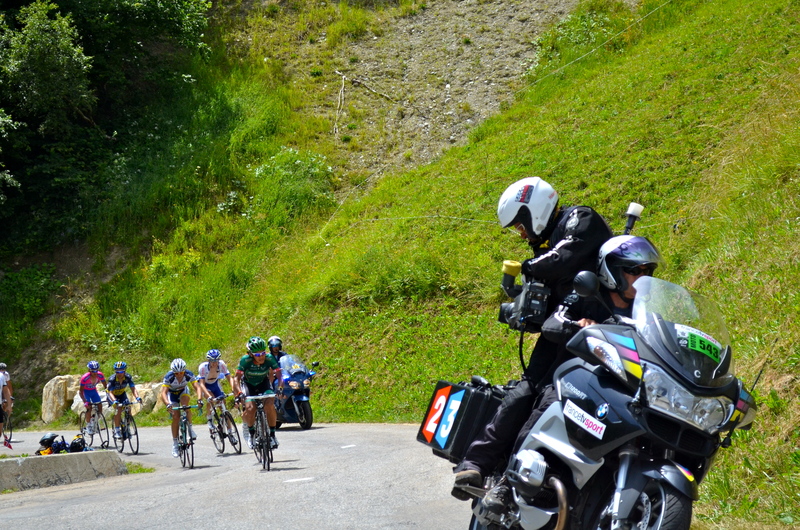 Unless you actually have to work tracking down hooligans who throw tacks down on the route of the Tour de France, this might just be the best job in the entire force. 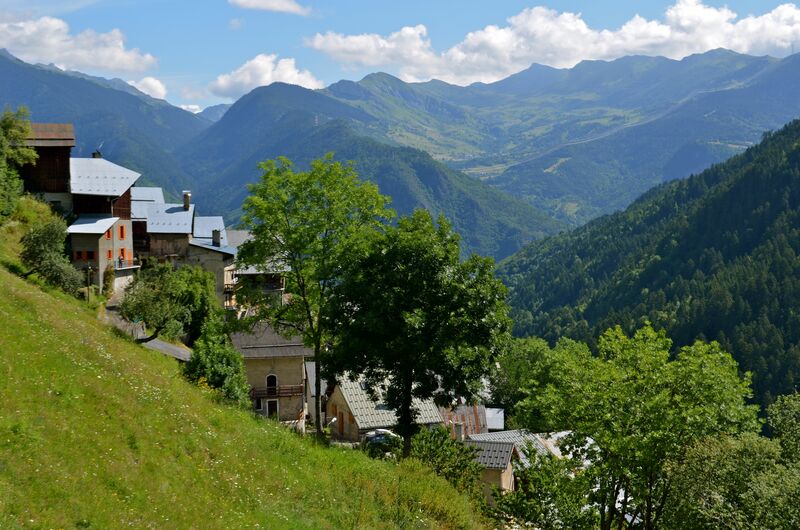 Can you imagine getting paid to ride a motorcycle up and down empty mountain roads all over France? Not too shabby. 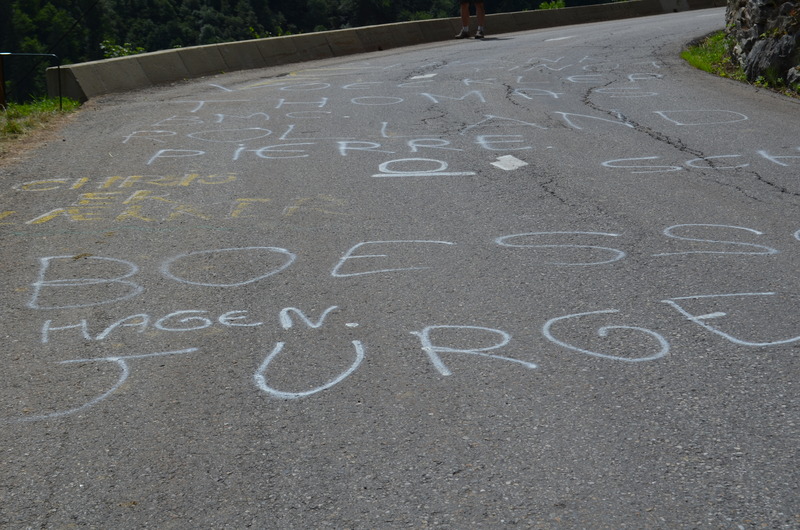 After the hike up, people spray paint cyclist’s names on the pavement, picnic and hydrate (and perhaps search for a place to pee). Then, you wait for the caravan to pass through and wait again. Since the waiting gives you time to enjoy incredible natural beauty and talk with other cycling enthusiasts, it is actually a lot of fun. Soon, the helicopters will stream over the horizon like in the movie “Apocalypse Now.” We hiked up to the mountain to a beautiful spot with a great few of both the mountains and the road leading up it. We weren’t the only ones who liked the view. 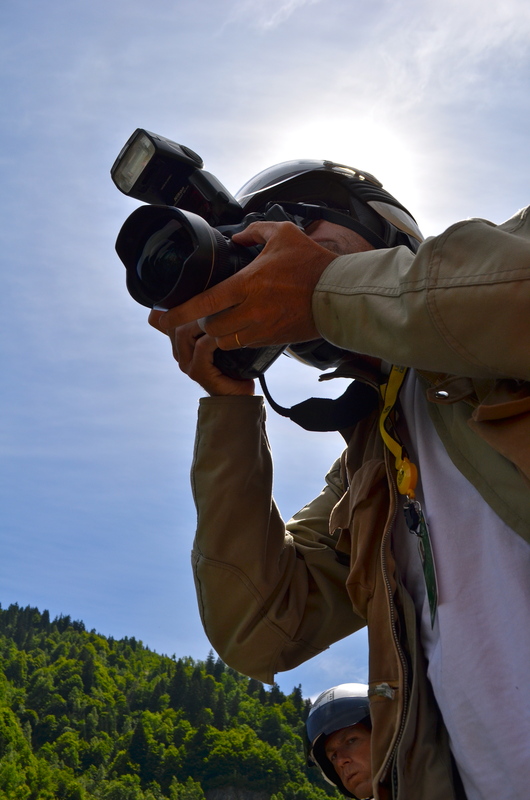 As the bikers climbed up toward us, the advance motorcycles with photographers on the back stopped and swarmed our spot. The motorcycles always have expert drivers. The photographers and cameramen hang off the back, performing seemingly dangerous feats to get the shot. Unfortunately, when some pootyhead spread tacks on the roadway two days ago, one of them was seriously injured. With their giant lenses, they were able to get much better shots of Bradley Wiggins and Team Sky streaming up the mountain. 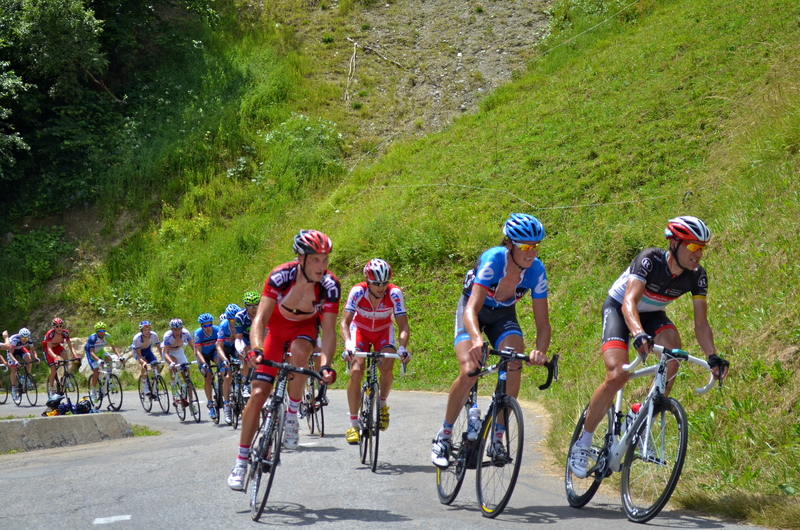 Normally, the first thing you see roadside is a breakaway group of riders. They are usually accompanied by police and cameramen (who you can see in the back). Usually, they follow one another. 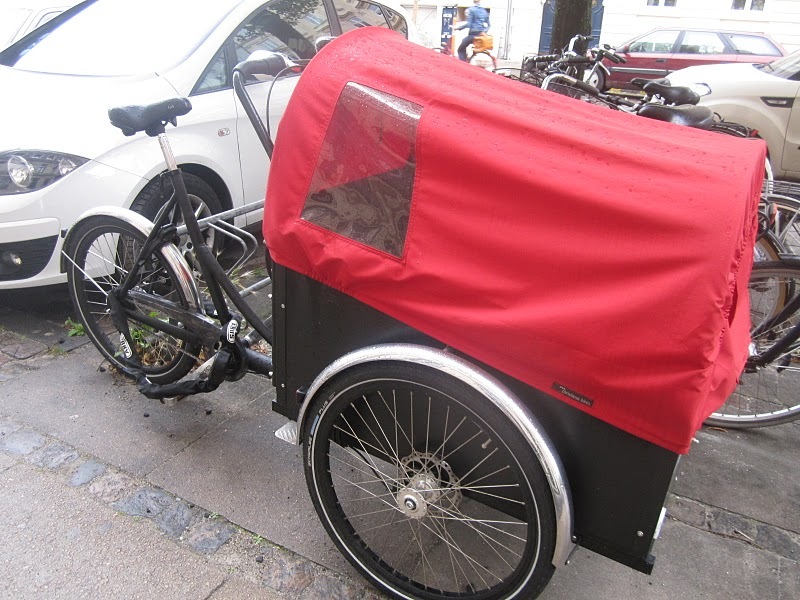 Having a rider in front of you reduces the wind resistance allows them to expend less energy. This gives the peleton incredible power if and when they choose to exert it. This is how they get pictures for TV. By the way the US commentators are better than the French ones. Understandably, French commentators are biased toward French riders. It’s not that. They are much less interesting and I learn a lot less from them. They don’t seem to show much of a sense of humor either. Thankfully, Phil Liggett and Paul Sherwen do the British coverage we get here in Switzerland, but I miss Bob Roll. 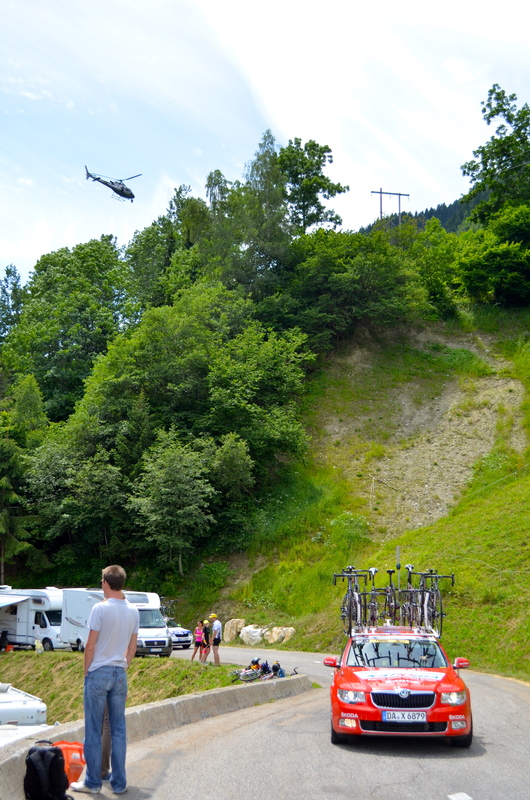 Eventually, the last of the team cars go by and the helicopters move on. After than, there isn’t much left to do except descend the mountain and watch the stage you just DVR’ed. Just in case you didn’t know, I’m famous. It is clearly me there on TV with the Detroit Red Wings jersey. 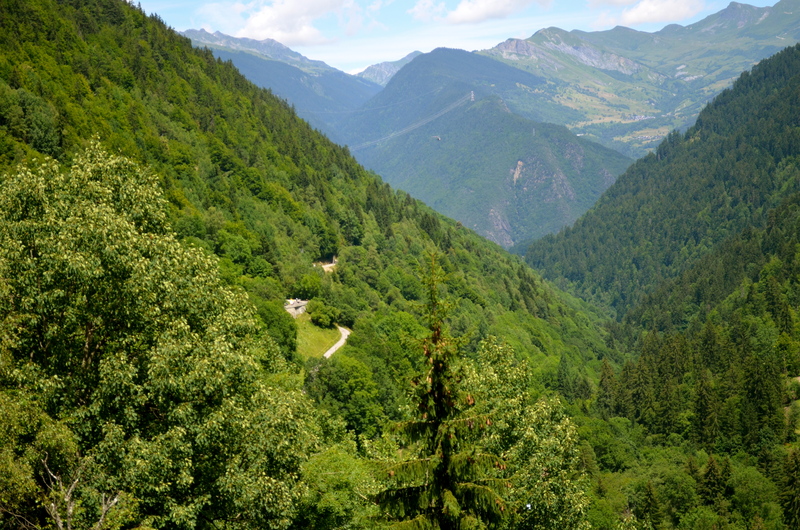 Today, the Tour de France‘s cyclists are riding the ‘Circle of Death’, a linkage of four brutal climbs. 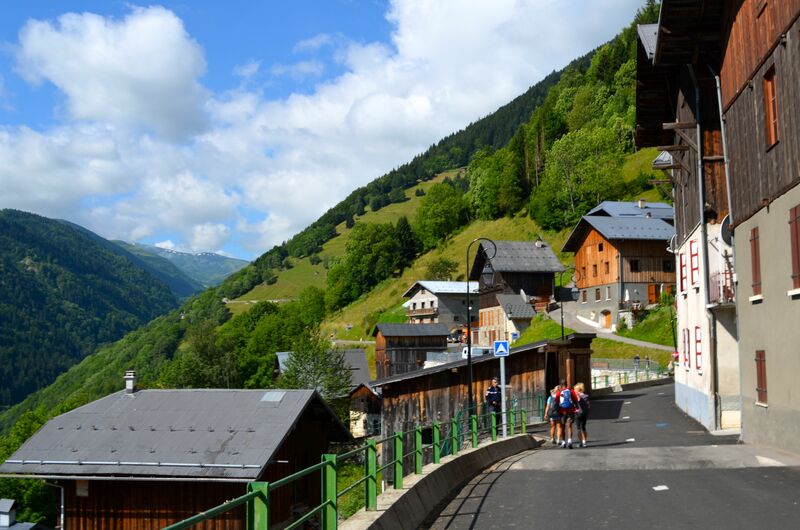 Tomorrow’s stage finishes atop the 1,615 meter (5,300 feet) mountain, Peyraguedes. They’re in the mountains baby! The steeper the grade the slower they go (providing you with better viewing). 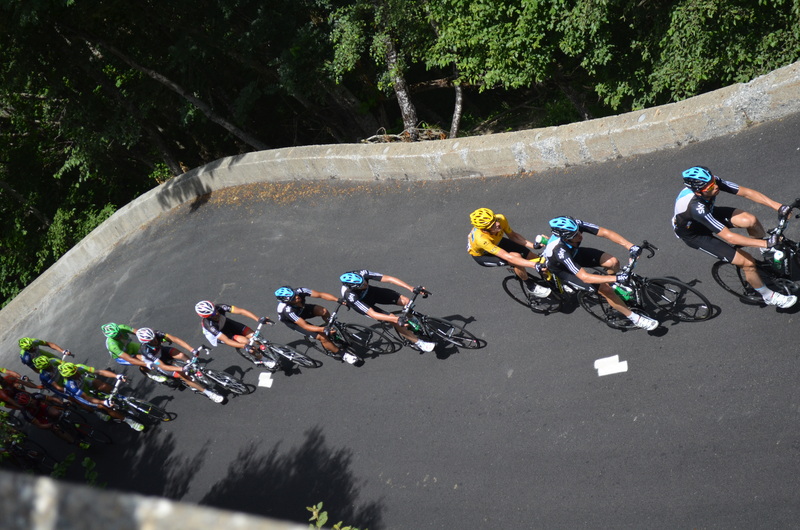 The later in the stage, the more spread out the riders. This means that instead of seeing them in an enormous group, you will see them in smaller groups and be able to pick out specific riders. A mountaintop finish is the ultimate. Who doesn’t want to see the end of a stage? 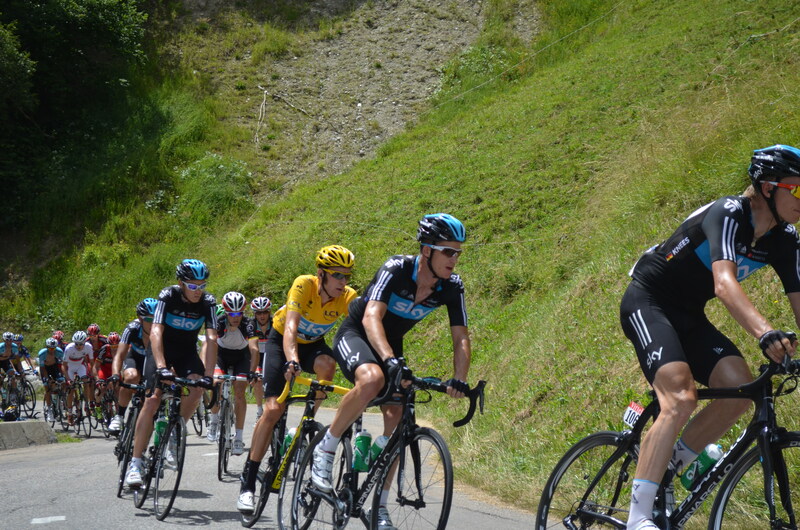 Seeing the Tour de France from a mountain was on my bucket list. I like logistics problems, but getting there can turn into a very advanced one pretty quickly. 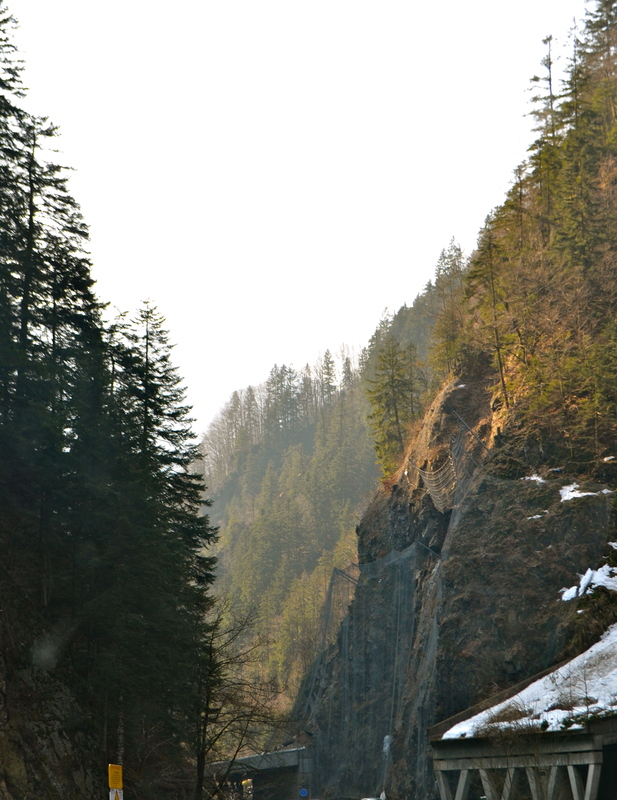 The easiest way to get a front row seat at a great spot on a mountain is to do a bike tour. Be prepared to bike up the mountain. If you can handle that, it’s pretty darn good. 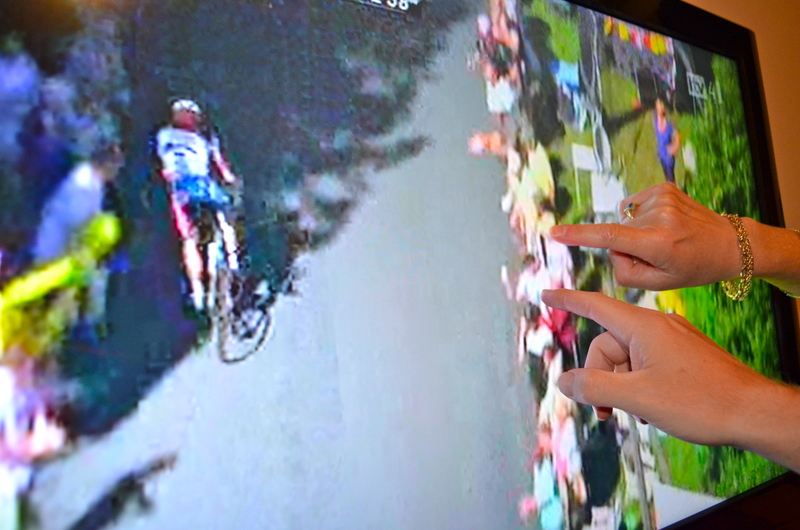 You’ll have a front row seat at a good spot with a TV (key to knowing what is happening in the tour). Plus these guys had support an a nice spread laid out for them on the mountain. Actually, now that I think about it, there is an easier way to get on a mountain. The easiest way is to have a bunch of money and/or in with a sponsor. 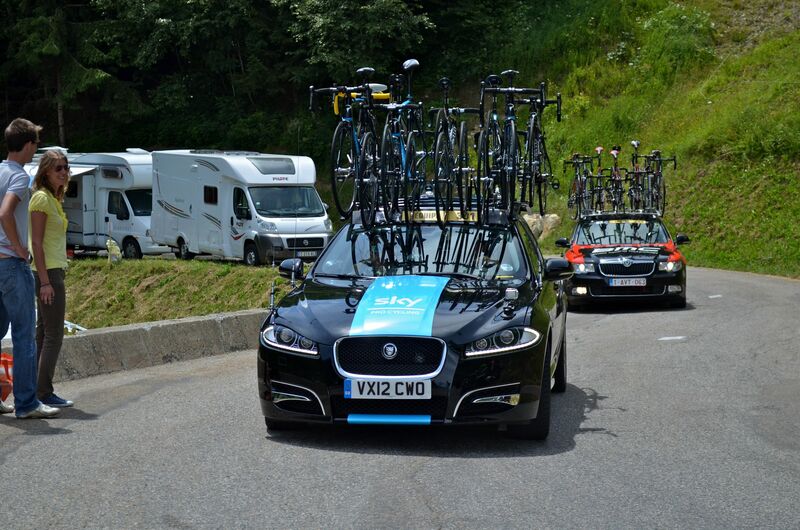 Although you might not be able to get in one with bikes, we saw tons of VIP’s in team cars. 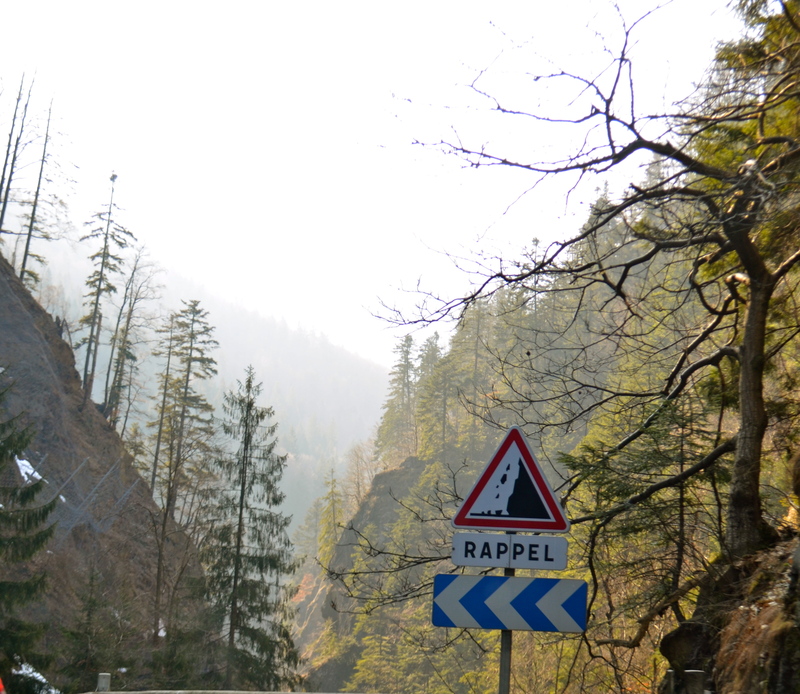 If you want to drive yourself up there, you might just be able to do it if you get up and on the mountains before the road closes (less possible the larger the mountain). Getting there the night before and camping is a good option. Loads of people follow the tour with caravans. 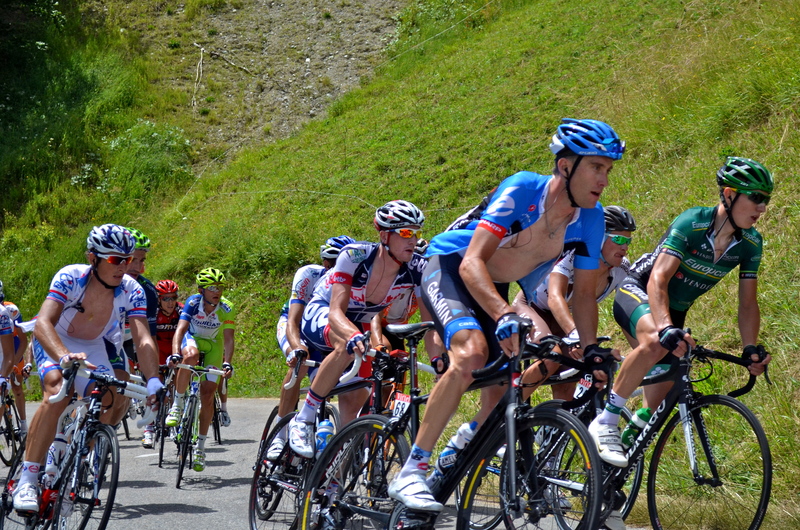 The larger the mountain (Col de la Madeleine, Col d’Ausbisque, Col du Tourmalet, Alpe d’Huez, Mont Ventoux, Col du Galibier, Port de Pailhères, Col de la Colombière, Col des Aravis, etc. ), the earlier they arrive. For large stages, they will arrive up to a week before hand (Europeans tend to have more vacation than Americans), and there won’t be any space left a couple of days beforehand. Others drive up in cars or vans and pitch tents. 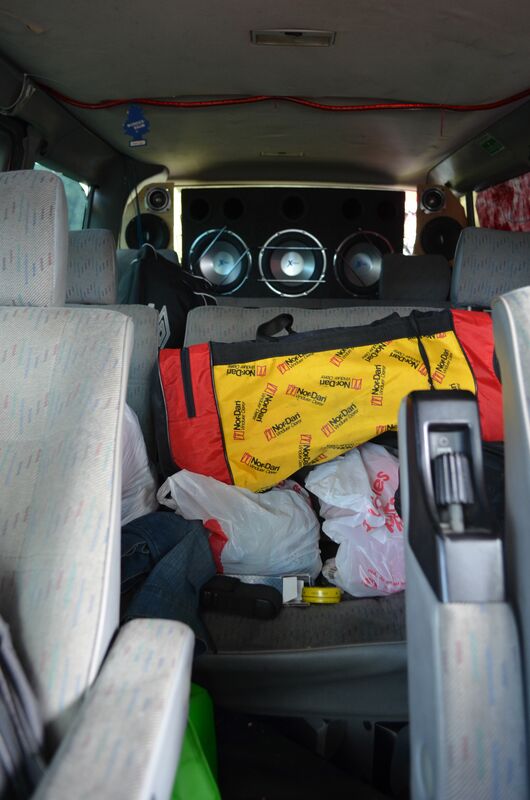 We met people who camped out, but I can’t imagine that sleeping in this van was very comfortable. On the other hand, those guys were full of pep and didn’t seem worse for the wear. Still others bike up. These guys looked like they were having a great time. 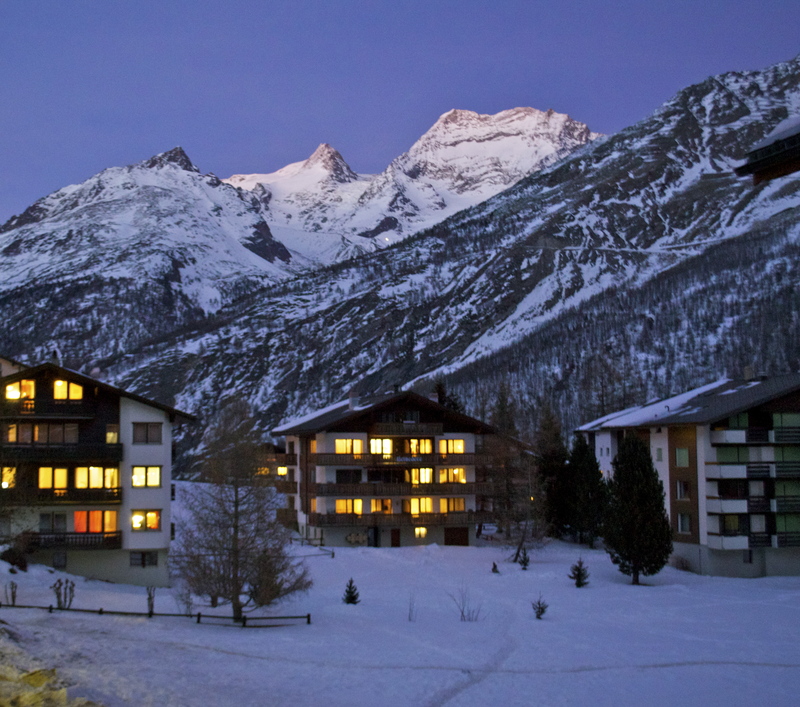 Boris and Natasha liked this option because it allows you to see the mountaintop, get some exercise and still sleep in a hotel. 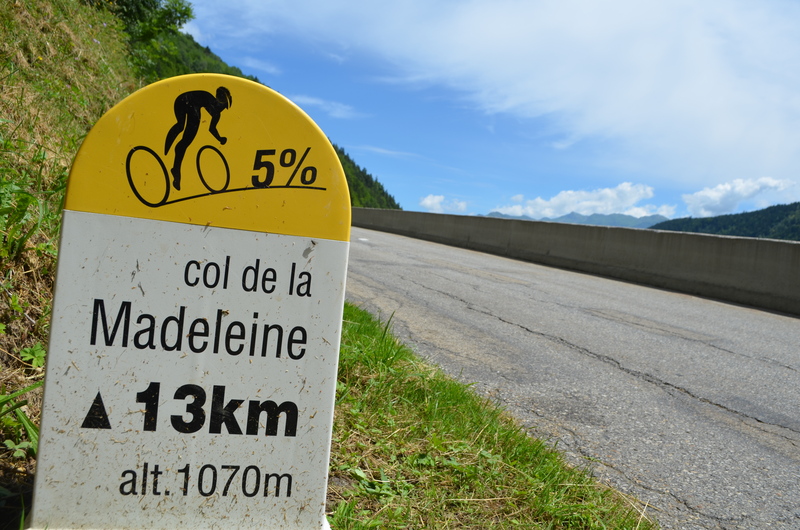 The police had already closed the roads when we arrived at Col de la Madeline. Apparently, police decide to close the road whenever they feel there are enough people up there. 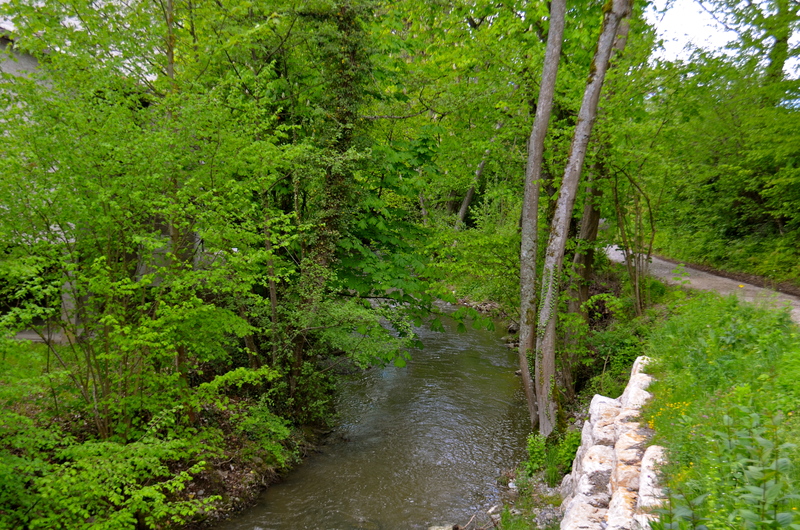 Forced to leave our car at the bottom, we hiked up…9 miles. We didn’t have much of a choice, but knew we would have to go it on foot at some point. It’s probably just as well. On our hike up, we didn’t see many places to park (or even stand) on the side of the road. 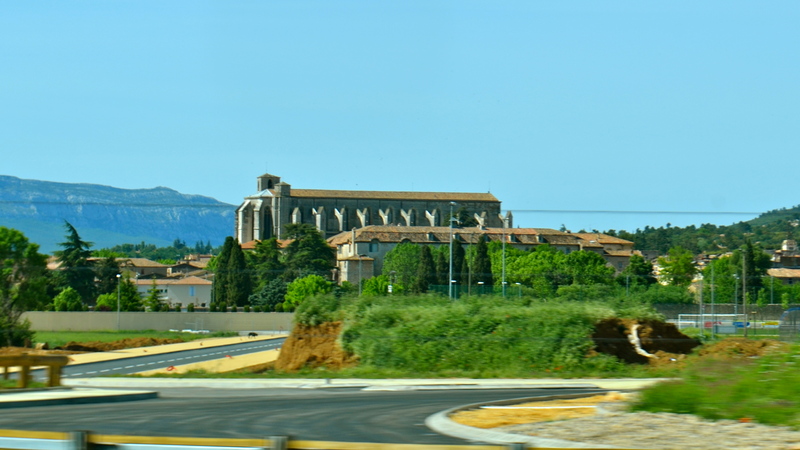 As you can tell from our trip though the largest town we passed, the mountain is a little steep and even the roads of this metropolis are narrow. The only problem with hiking 9 miles up is that what goes up, must go down. Once the tour passes through, there is a mass exodus. It took us about 2 hours to get down. 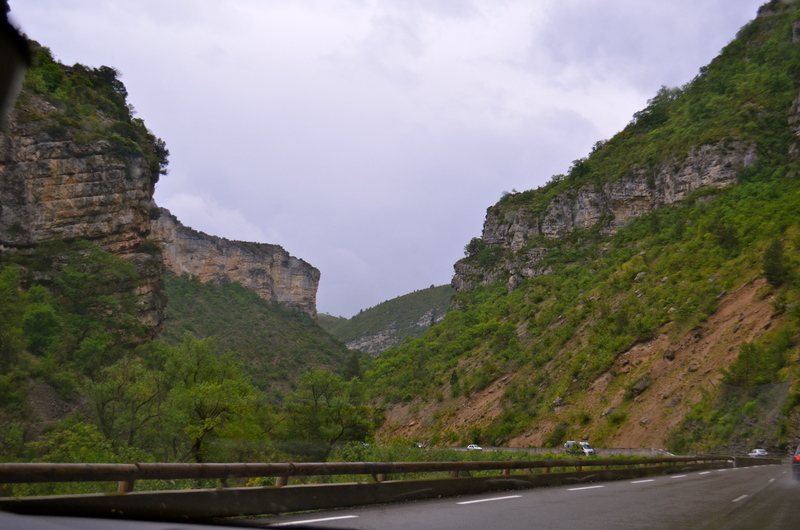 One hour into it, the tour had gone over the top of the mountain and they opened the roads to vehicles. This meant that in addition to dodging bikers racing downhill, we started dodging cars and caravans too. 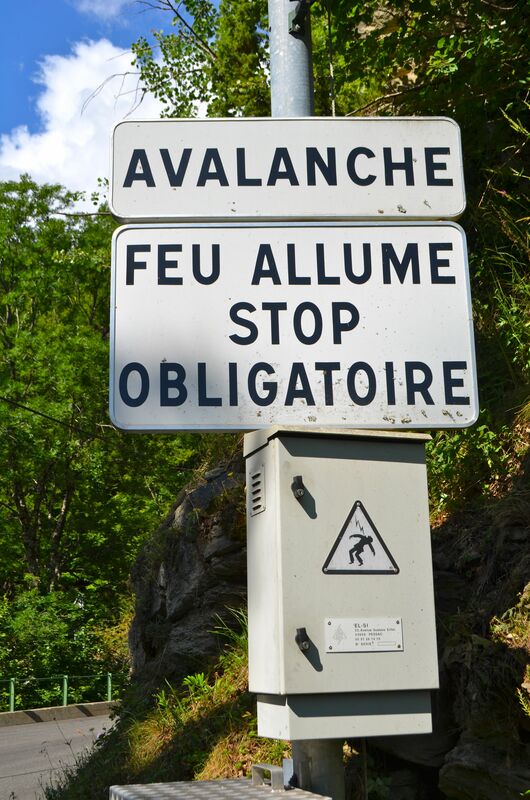 At least we didn’t have to worry about avalanches at this time of the year. We made it down in one piece and I love the Tour more now than ever before. Epic mountain. Epic day. 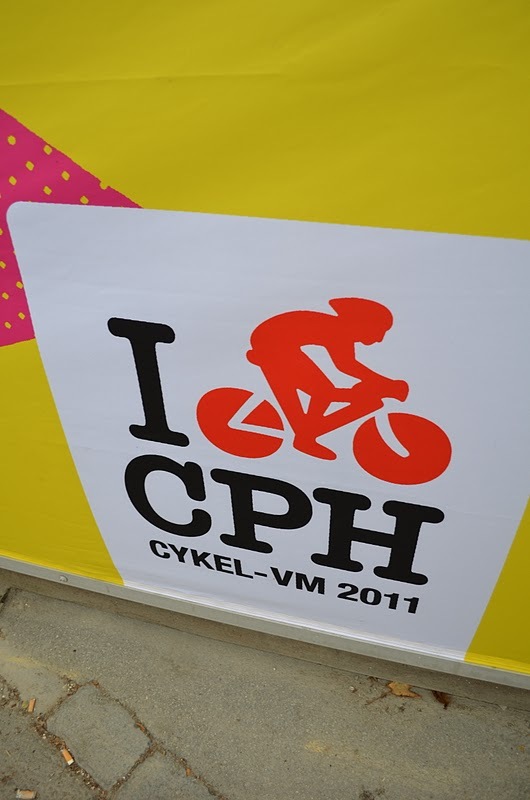 Before the cyclists, the tour caravan sweeps through, showering fans with loads of virtually useless promotional materials. 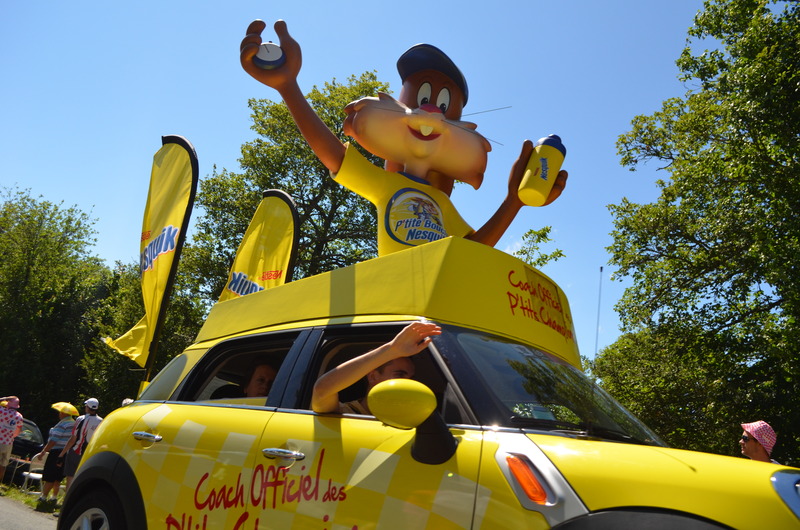 For the unfamiliar, sponsor vehicles are a significant part of the spectacle that is the Tour de France. Like Rose Bowl Parade or the Macy’s Thanksgiving Day Parade, the floats astonish. While the downside is garish commercialism on steroids. 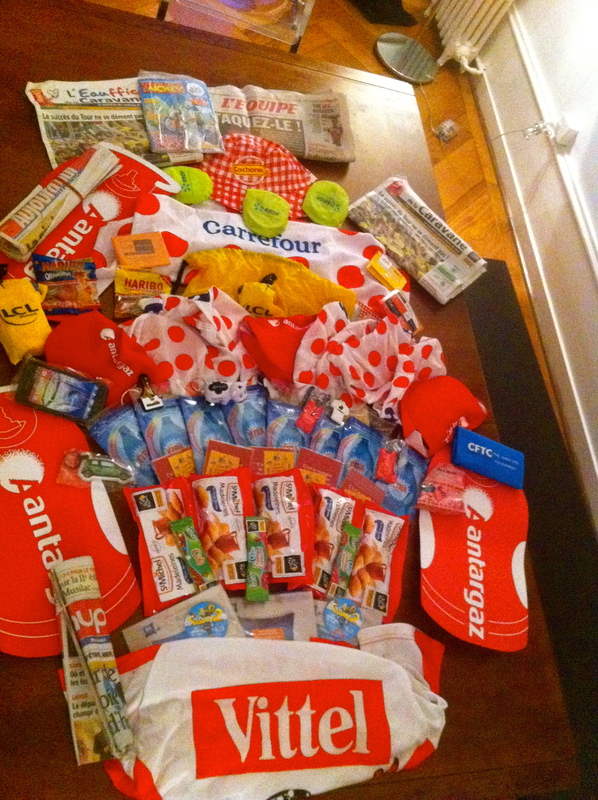 The upside is it is that entertaining while you wait for the riders and you get tons of free stuff. The booty we brought home covered the dining room table! I have a soft spot for anything dog related, but most people loved the giant puppy float (I’m keeping the key chain they threw us with the dog on it). 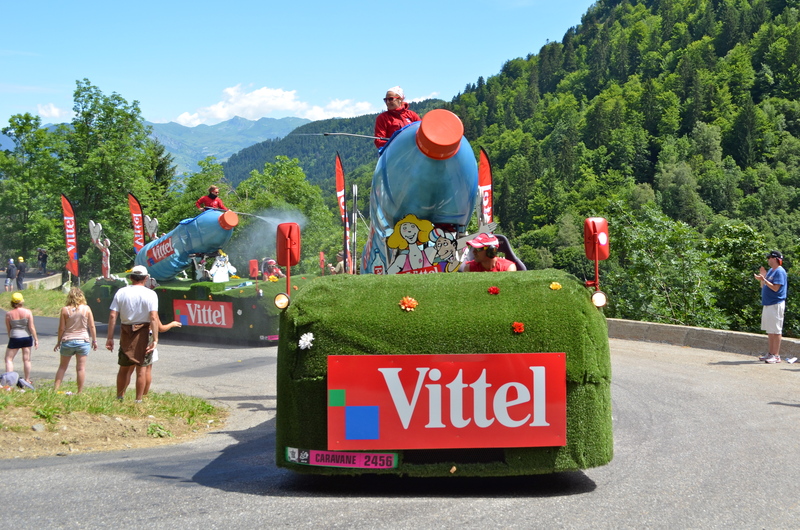 The Vittel float sprayed the crowds with water. It was more of a cooling mist than a waterfall, but I still put my camera away when they got close. Everyone loved the giant rubber duckie. Forget the Viper I eyed at the Geneva Auto Show, I kind of want the duckie for my next car. It looks like it would be a pain to park though. 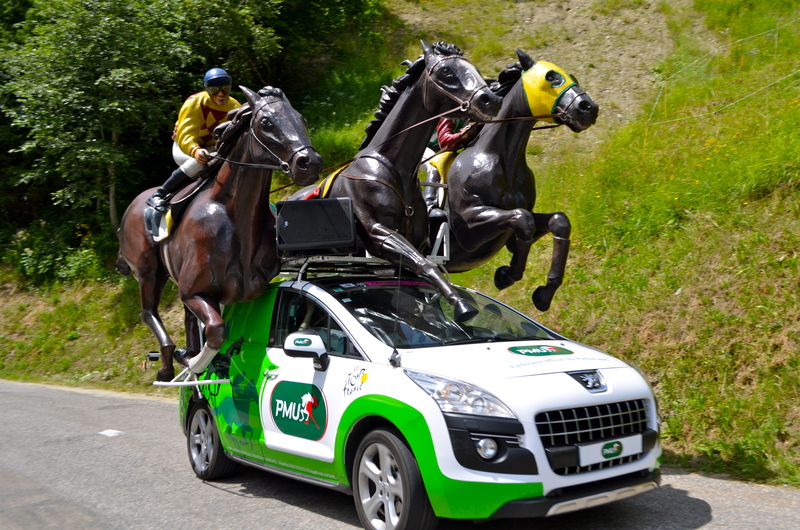 I’m not a gambler, but the PMU horses were pretty cool. 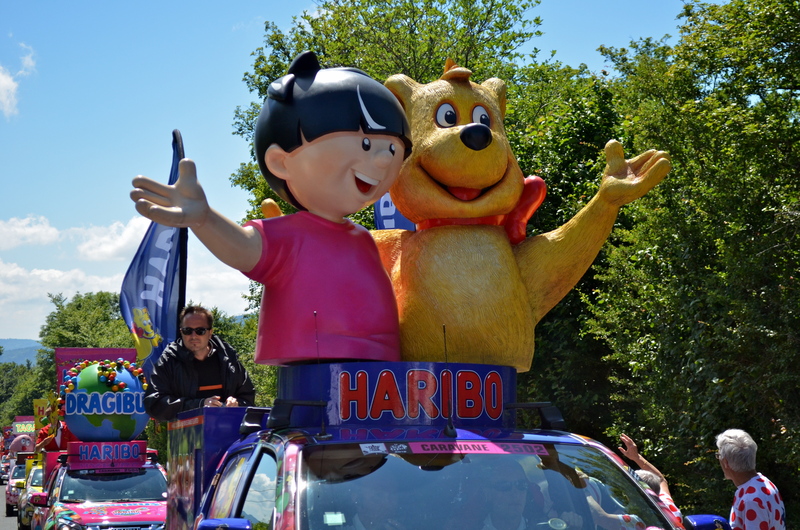 Some of the floats were aimed at kids. I’m guessing the cyclists are eating something more nutritious than loads of gummy bears. To be one of the women (or few men) who toss the loot, you must be attractive, willing to spend a month throwing things out on a vehicle, good at dancing while harnessed into a vehicle (see above), and able to withstand blaring techno music 8 hours a day for three straight weeks. They looked like they were having a pretty good time and there are worse things than spending a summer tooling around France. The vehicles are as large as the small mountain roads permit. 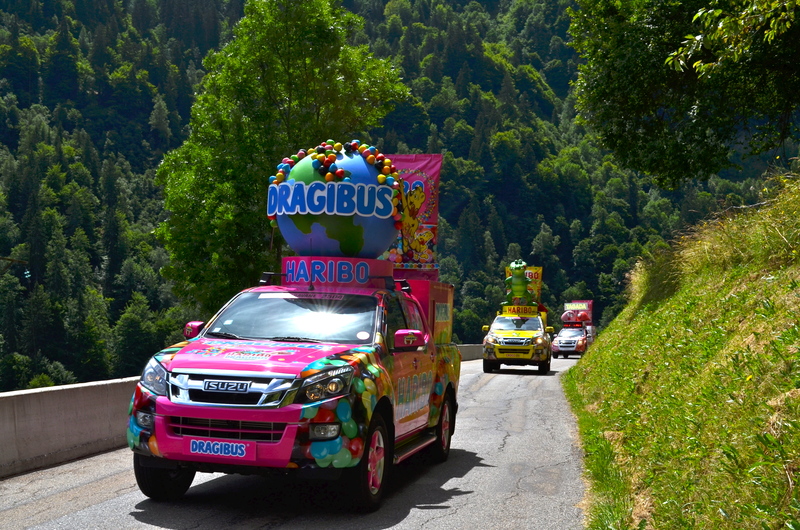 With spectators jumping into the roads, blaring music, bags of gummy bears flying through the air, steep roads and dangerous curves, the drivers must be amazing. I get a bit nervous driving these roads without having to worry about crowds of people and the ridiculous amount of chaos. A tow truck accompanies each part of the caravan, ready to immediately remove any breakdown from the road. 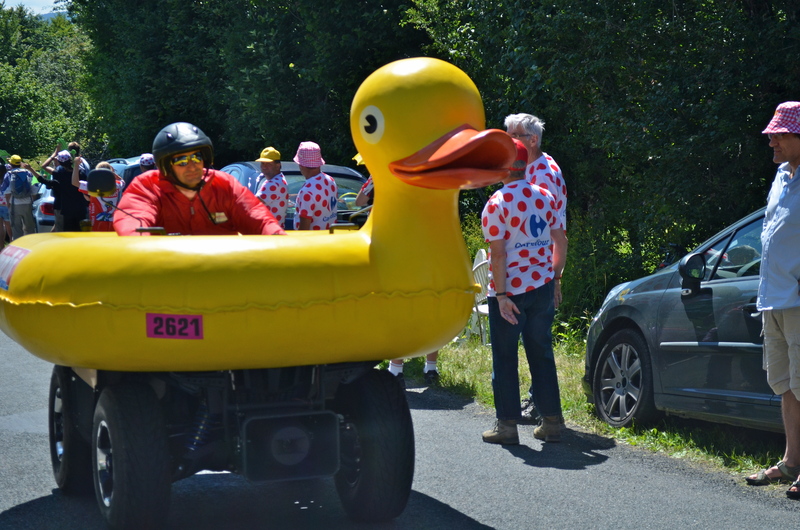 We also noticed that they were accompanied by an ambulance, just in case a vehicle hits a spectator (which actually happened on day two of this year’s Tour). I adore him. He’s great. I love him so much that I married him and hope to remain married to him all our lives. Nevertheless, cyclist Jens Voight may be cooler. In fact, he may be the coolest man alive. Fans of cycling love him. Look at the enthusiasm on the guy in the red shirt’s face. Heck, look at the enthusiasm on Jens’ face. 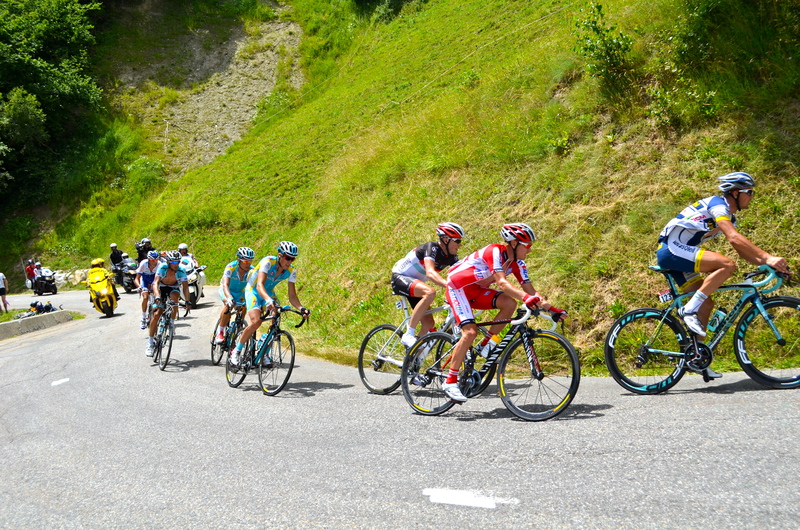 We watched the stage from Macon to Bellegarde-sur-Valserine, France and were lucky enough to see Jens Voigt (who at 40 years old is the oldest rider in the race) attack. He is known for his epic attacks, ability to endure pain and delightful personality. 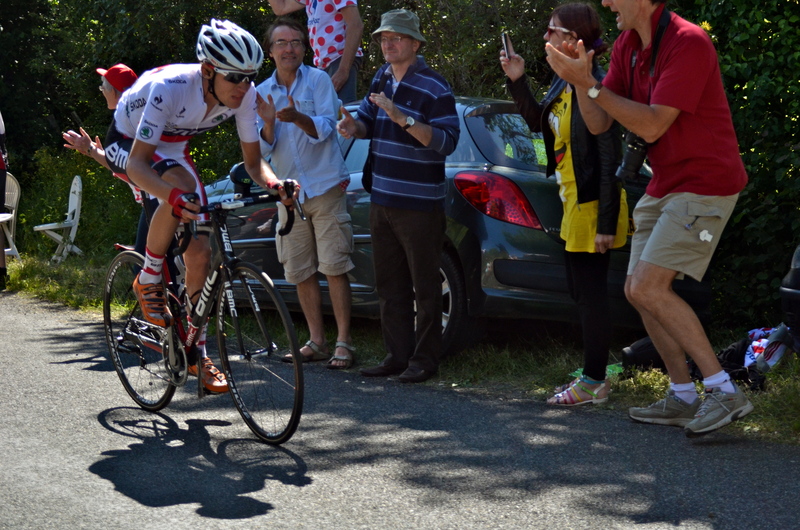 We got to see him climbing the last climb after he escaped from a 25-man group. 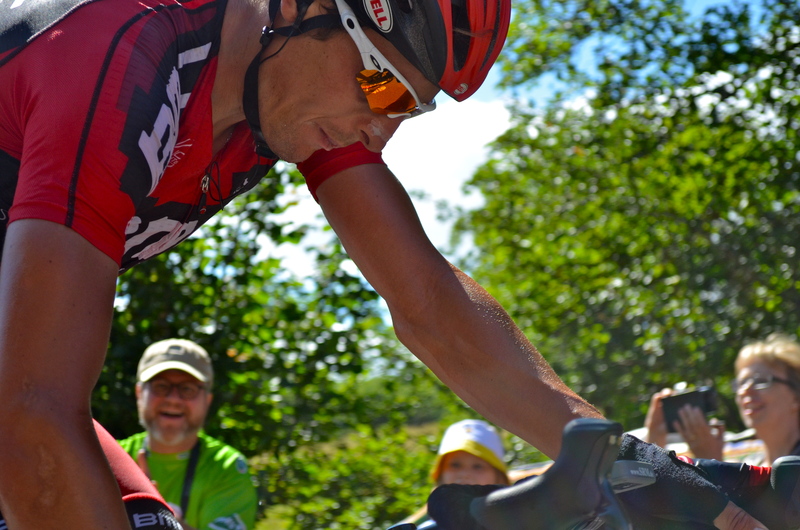 He attacked, lost ground and regained it, just missing the stage win, coming in third. Seeing it live. Priceless. 10. 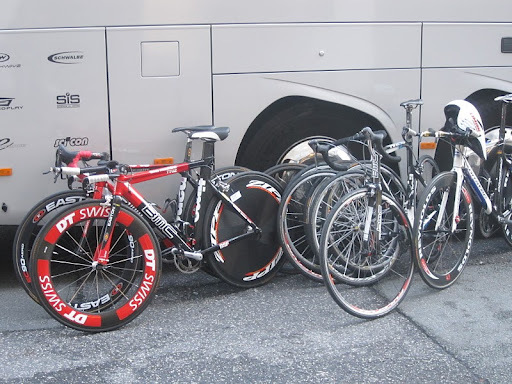 In the 2010 Tour de France, Jens Voigt’s front tire blew out, causing him to crash. 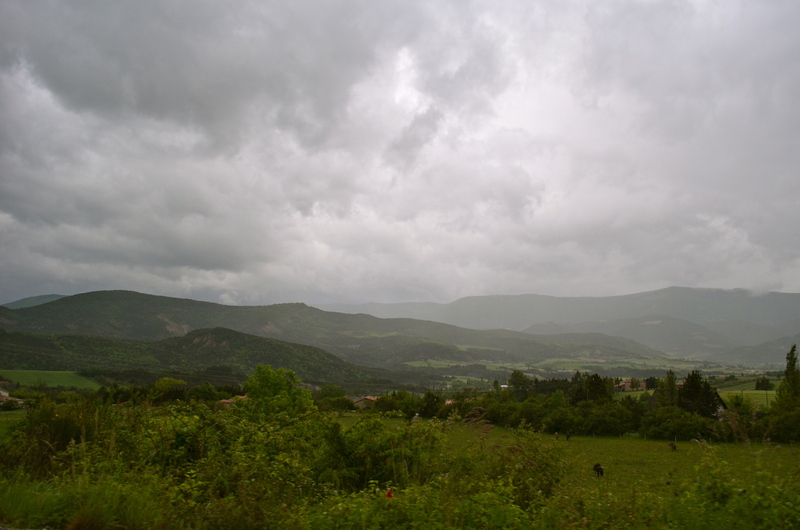 He’d been speeding down mountain in the Pyrenees (Col de Peyresourde) at 70 kilometers (40 miles) an hour. Needless to say, he hit the pavement hard, shattering his bike, breaking ribs and creating a huge gash in his elbow. Stop? Never! Bleeding, Jens borrowed a kid’s bike and rode it for 20 kilometers (12.5 miles) until he he could get a new bike from his team car! 9. 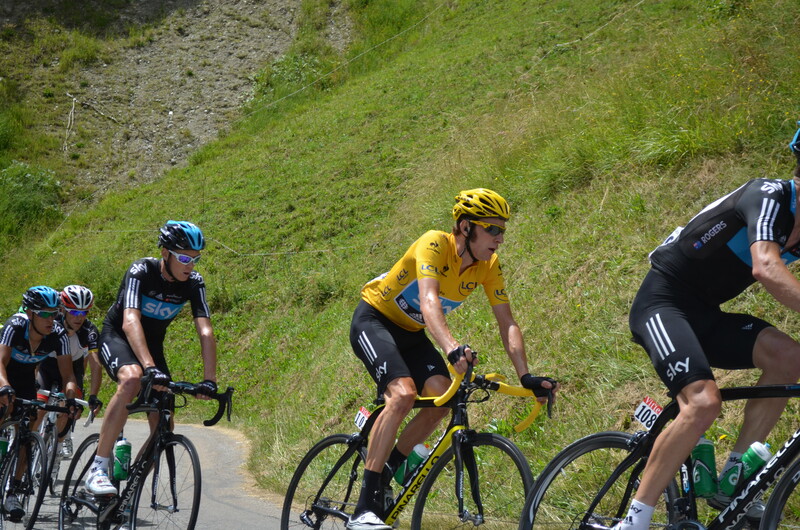 While riding up Alpe d’Huez (an epic mountain) the Tour de France, Jens gave a kid his empty water bottle. Happy and loving life, he was angered when we saw a middle-aged guy tackle the kid and take the bottle. Fired up and pissed off that the jerk had rained on his parade, he stopped, turned around and coasted down the mountain. 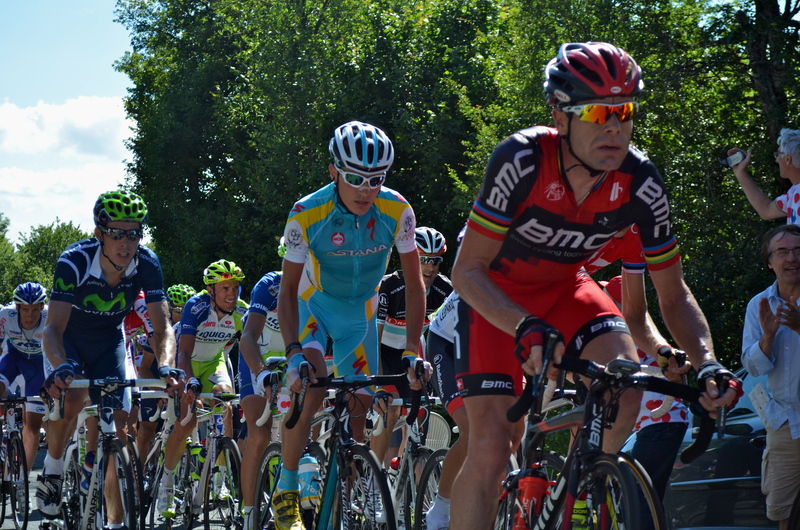 Perplexed observers likely wondered whether he was injured or abandoning the tour. Jens found the guy in the crowd, pointed to his bag and told him that the bottle he grabbed was for this kid. The jerk gave it back and the crowd went nuts. 6. If you want to have some fun, check out all of the Jens Voightisms on the internet. One of my favorites, “Jens Voigt will never have a heart attack. Jens Voigt’s heart isn’t stupid enough to attack him.” I like them better than the Chuck Norris-type tributes because with Jens, they are probably true. 5. Jens went down hard in the 2009 Tour de France while descending the the Col du Petit-Saint-Bernard when his front wheel inexplicably lost traction. He bit it hard, face first. He lost consciousness for three to four minutes. He had a concussion, a litany of bruises and broken bones in his face. He hit so hard that he was lucky to be alive. In typical Jens fashion, he called his wife that night and told her that he knew who she was and their kids were, that he just needed some time to heal. 3. He looks to differentiate himself from his competitors and has settled on determination. Jens said, “It’s about determination. These days, everybody trains hard and smart. Everybody has a decent technique or tactic… a good bike… You’ve got to look somewhere else to make a difference. 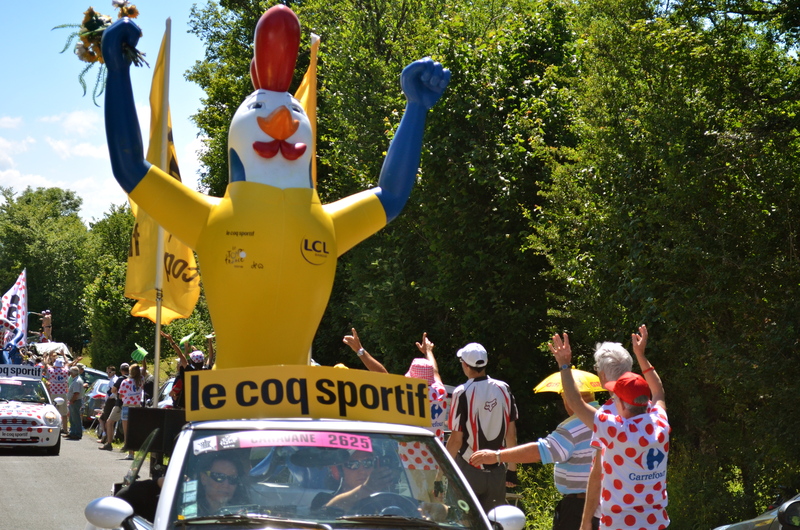 Tour de France winners used to win by 15 minutes. Today, 15 minutes out, you’re in 35th. So the one with the highest pain threshold takes it. If you can suffer a little bit more, go out hard one more time, it intimidates the other riders, even if you’re only slightly better than them. That one more push could crack your opponents and you’re out front while everyone else in the back arguing who’s going to chase you. Let them play the poker game. Up front, it’s all or nothing. I try to tell the guys that. And I have enough experience to prove it.” In other words, I am willing to suffer more than you, you don’t want to force me to prove it to you. 2. 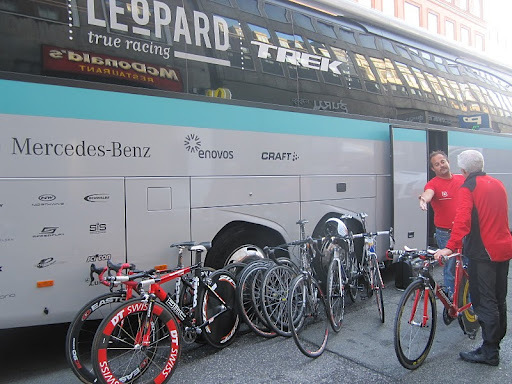 In the 2011 Tour de France, true to his motto “always attack,” Jens escaped in a breakaway with several riders in Pyrenees. 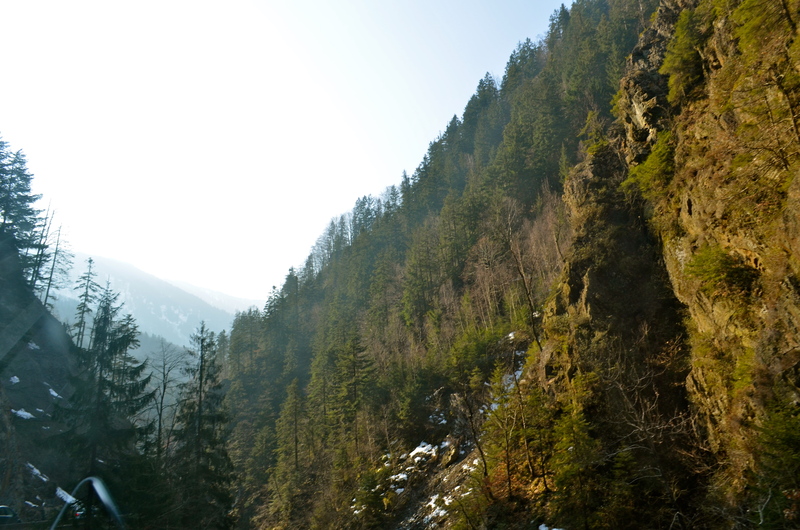 On a steep descent, Jens tumbled off the side of the mountain into a ravine. He climbed out, dragging his bike with him. He got back on his bike, began riding and promptly crashed again, hard. Jens rejoined the peleton so that he was there for at a critical moment in the race, to sacrifice himself for his star teammates, the brothers Andy and Frank Schleck. No wonder they love him. After two nasty falls, his bloody legs broke the breakaway. Vintage Jens. 1. Jens takes advantage of his job to see things. Some people just sail through without looking. 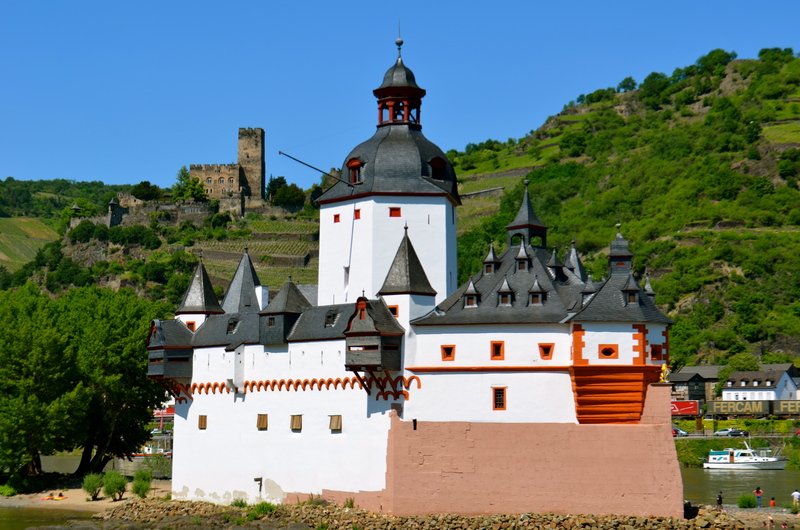 He comments on seeing castles or the shortest town name ever. How can you not appreciate someone like that? Others dress like they normally do. These guys might not normally plan to all wear same hot pink jersey. Then again, they might. People show their enthusiasm for the Tour in their dress. 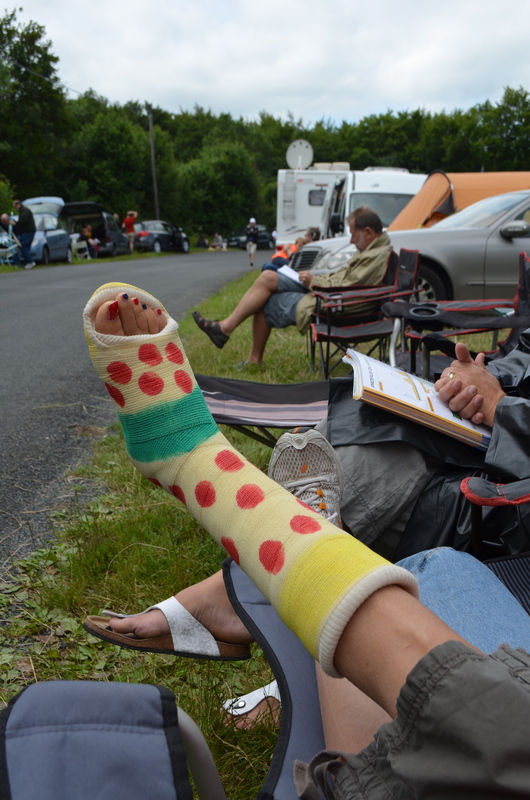 This poor lady from Luxembourg had a cast. She painted her toenails in her country’s colors and drew red and white polka dots (to represent the King of the Mountains polka dot jersey), yellow and green stripes (for the Yellow and Green jerseys that go to the overall tour winner and the leader in the sprint points). and the United States (although Boris and Natasha said that there weren’t as many Americans as there were during the Lance Armstrong era). 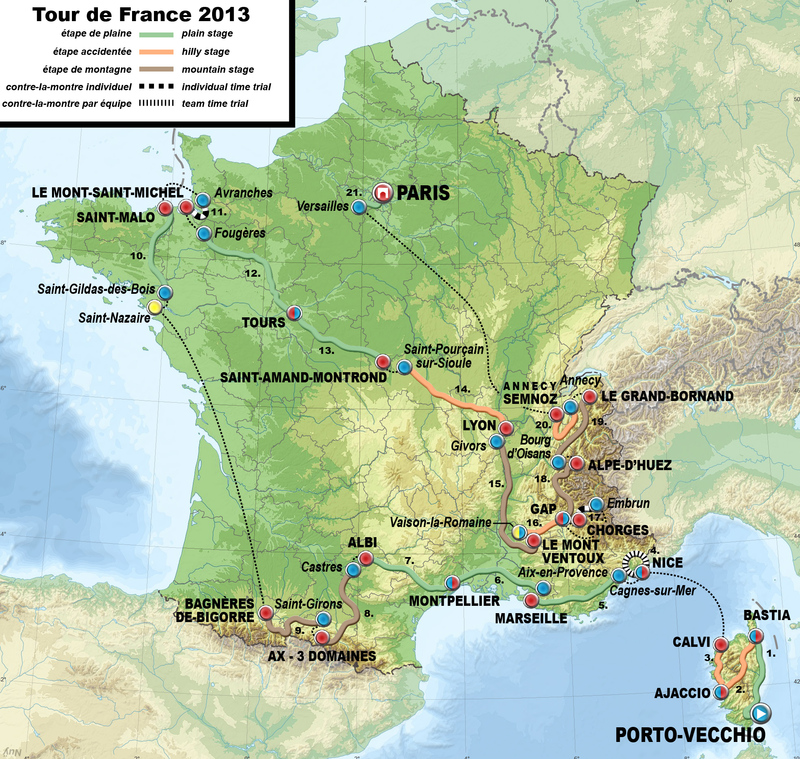 Having a rider win the Tour de France, is a huge boost to cycling in that country. People become more familiar with the sport, it gets more publicity, people starts buying more bikes and riding more. 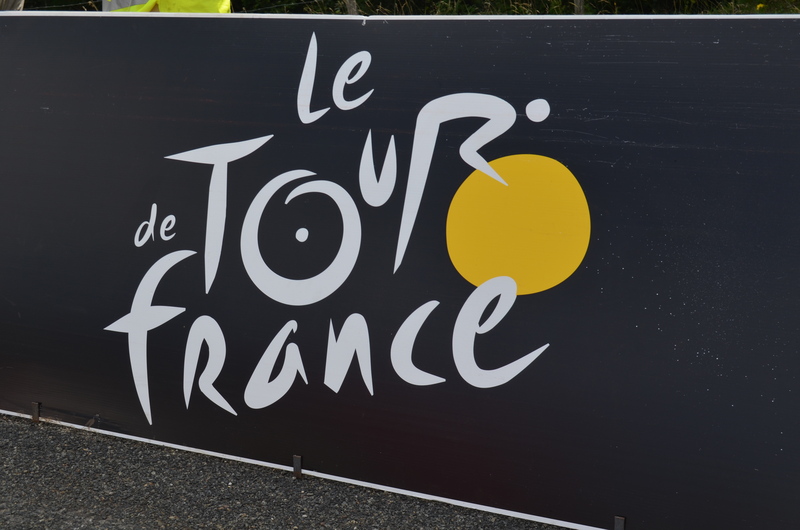 Australian’s interest in cycling and the Tour exploded with the success of Australian Cadel Evans who won the Tour last year. We saw tons of flags we’d never seen before. There were tons of Brits and we saw several of these three-legged flags. 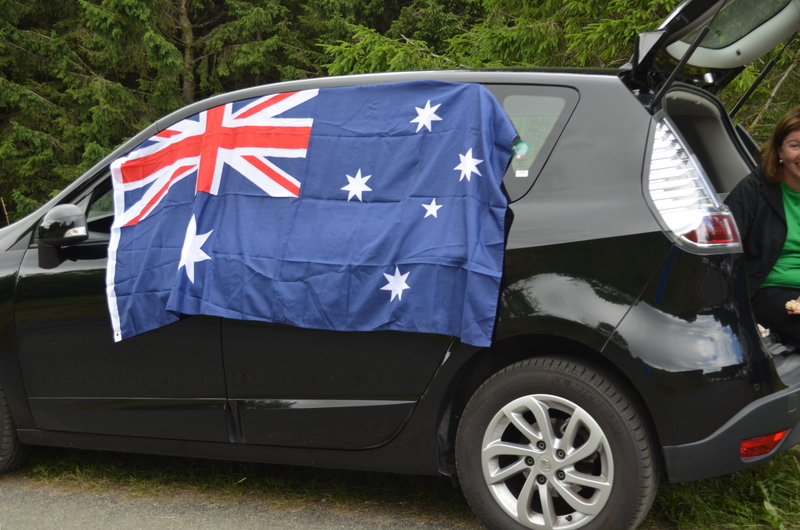 We learned it is the flag of the Isle of Man, the home of legendary British sprinter, Mark Cavendish. Undoubtedly, the Queen, Prince William and Kate are all Cavendish fans. Someone else had a theory that the nationalities of fans on the mountain revealed something about how economies are doing. 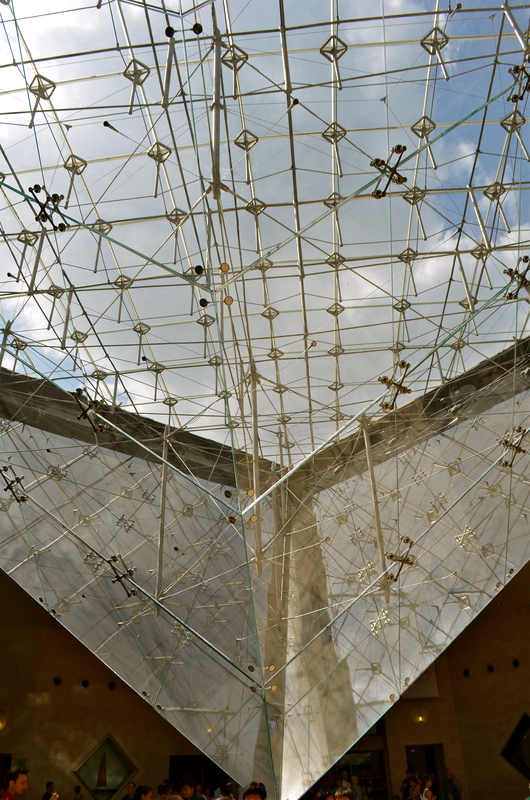 Vacations in France aren’t usually cheap. 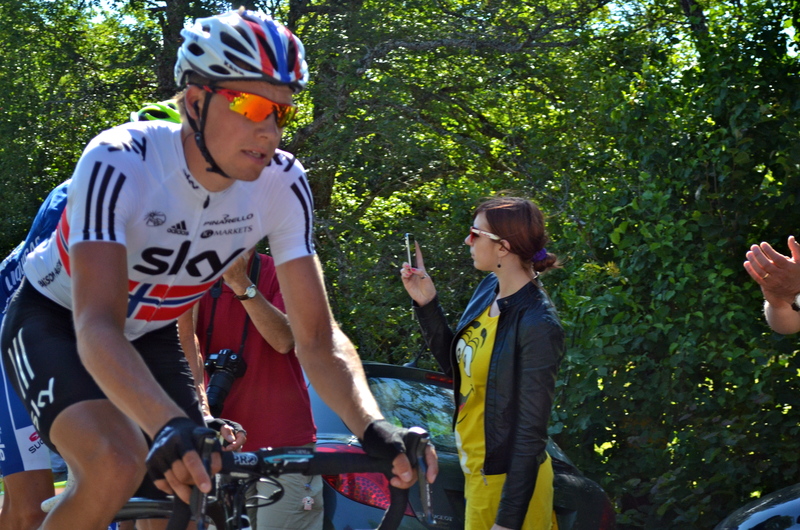 We saw tons of Norwegians (who went nuts for Team Sky‘s Edvald Boasson Hagen). Norway is definitely not hurting. 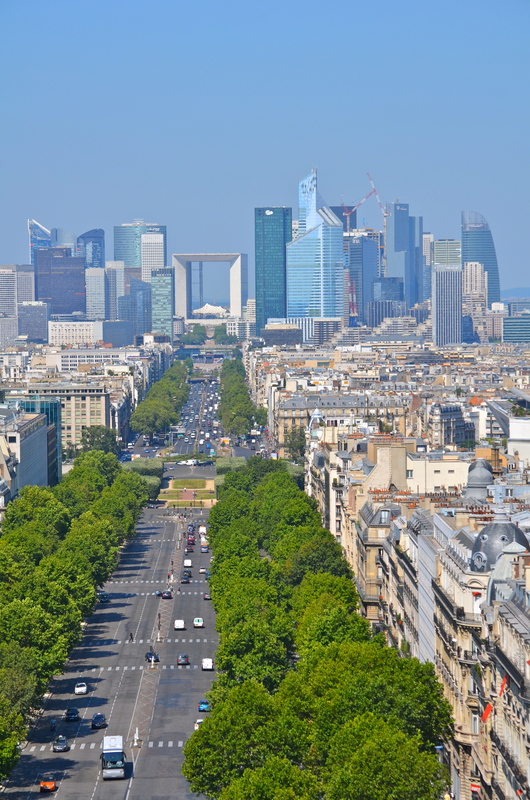 The UK, the Danes and the Germans have some of Europe’s strongest economies. Then again, it could have something to do with geography and when people have vacation time. 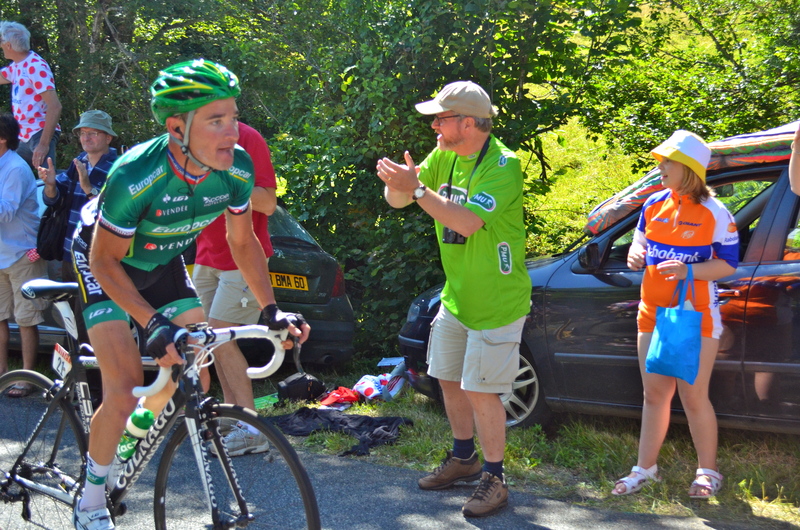 French rider, Thomas Voeckler, won stage 10 from Macon to Bellegarde-sur-Valserine. 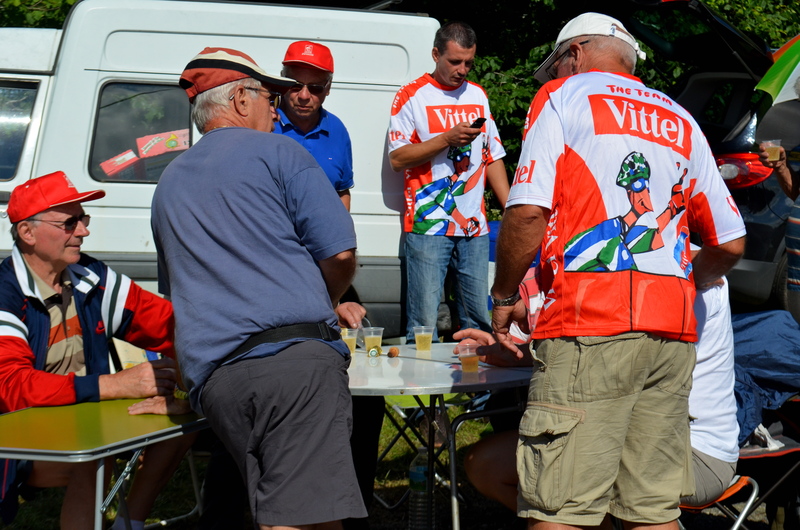 How do Frenchmen celebrate a fellow countryman’s victory on a stage of the Tour? With champagne, bien sûr. We had to hustle to get to the next day’s stage so we didn’t stick around to see if they had thongs. I have said it before and I’ll say it again. 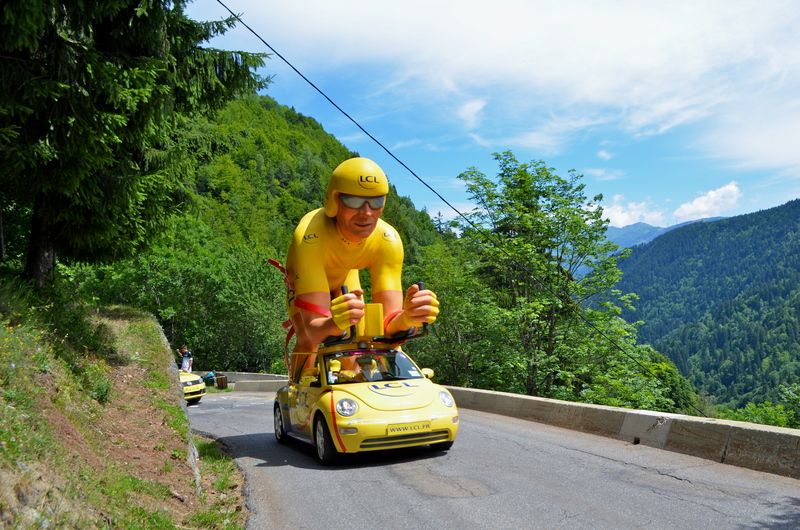 I love the Tour de France. Being the dork that I am, I have watched every stage of the Tour for virtually the past decade. How have I accomplished this feat? I get the TV to watch the Tour in July. The rest of the year, I give him the TV the rest of the year to watch all the football, basketball and hockey he wants. It’s a fair trade. Watching it on TV, I always dreamed of seeing it live. Guess what? It finally happened. 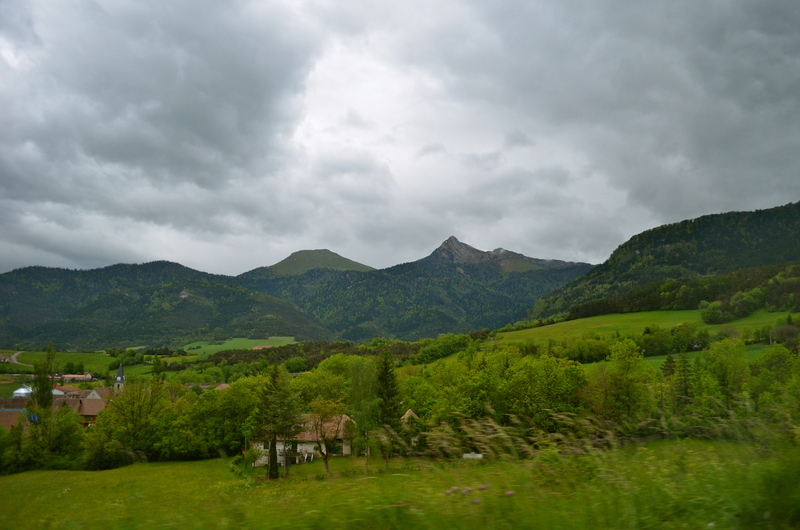 On Wednesday and Thursday, I was on mountains in France in a Detroit Red Wings jersey, getting sunburned, and taking in the spectacle. 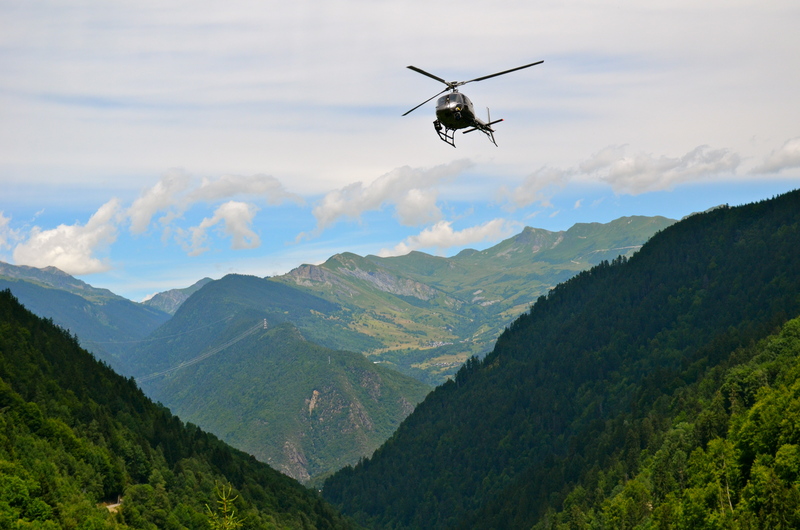 Watching the tour on TV, you can’t fully appreciate the beauty of the mountains the colors, the helicopters, and the excitement. You can’t meet the other fans. They are delightful and quite friendly. I don’t know of many places where you can meet so many people from other countries in such a congenial environment. The excitement was contagious and everyone made the most of it. 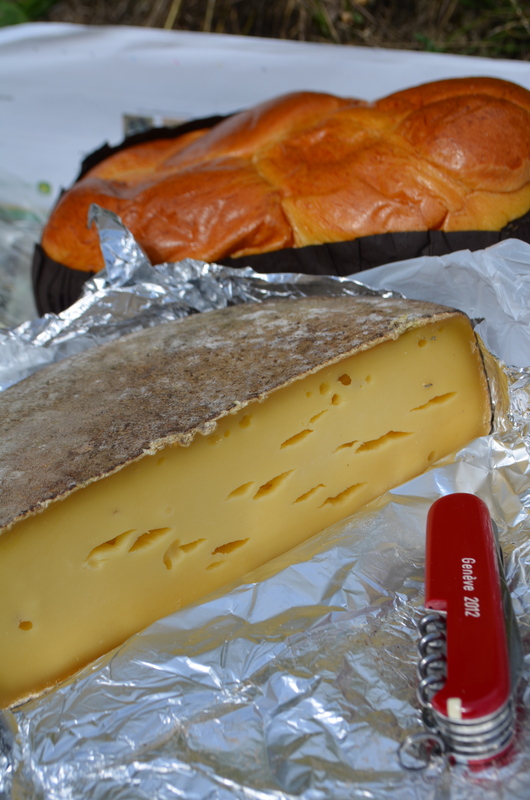 On the way up Col de la Madeleine, we stopped and bought this wonderful hunk of local cheese out of someone’s barn for our picnic. Because you have to get on the mountain early before they close the roads, people picnic, eat, drink and are merry. Everyone was having a good time. 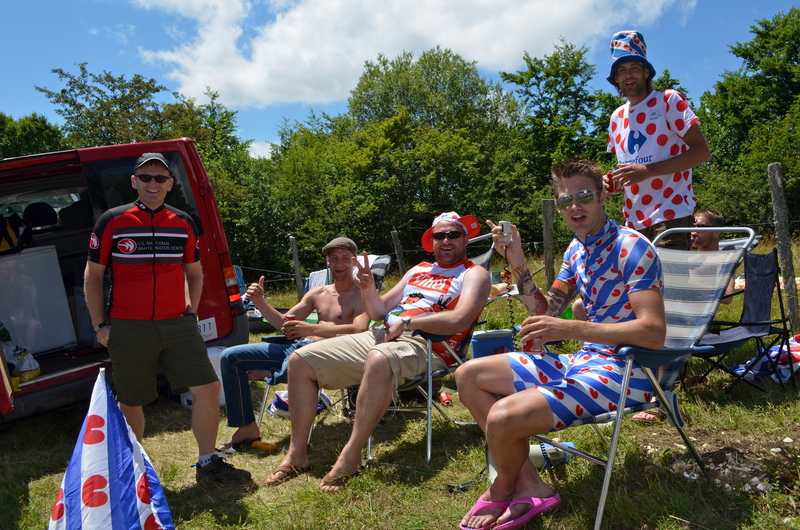 True fans of bicycle racing appreciate seeing these guys and go to great lengths to do it. 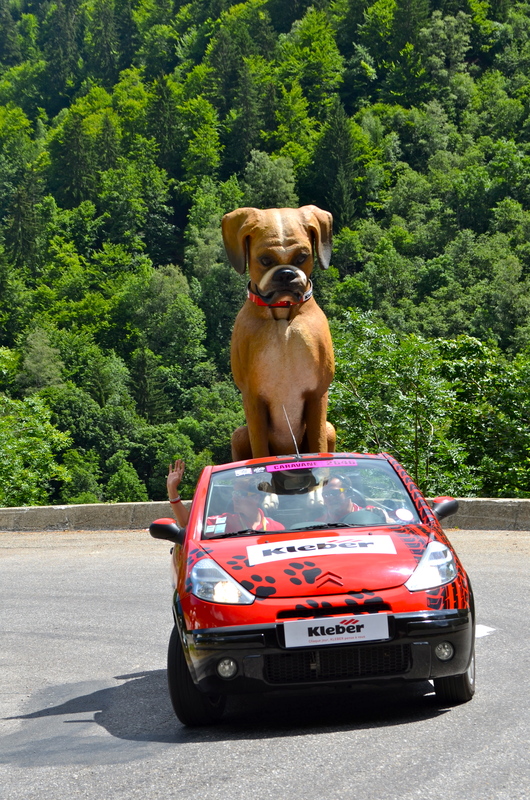 My guests (Boris, Natasha and Mr. Peabody) hiked with me 18 miles up and down a mountain to see the stage on the Col de la Madeleine. Others, biked up to the peak and back down. Some people camp out on the mountain days ahead of the stage to get a good spot. The rich and lucky get to ride in the cars (although I can’t imagine the view of the cyclists is that good) or get shuttled to a viewing area with a TV at the top. 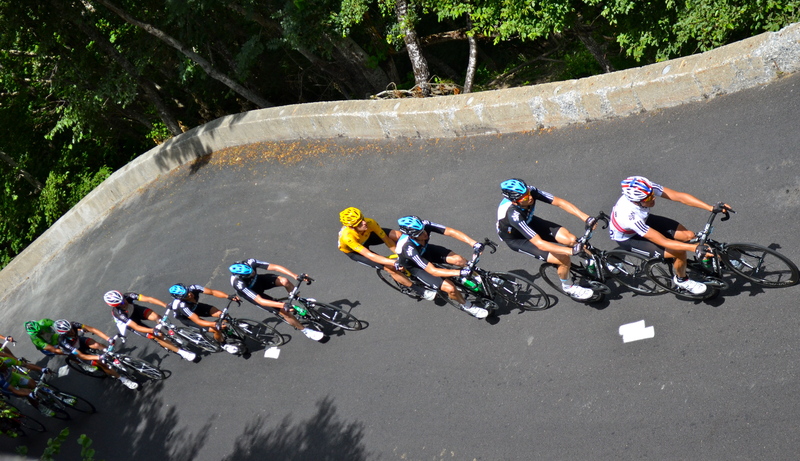 Even the trip from one stage to another was exciting for us cycling fans. We saw NBC Sports cars racing down the highway to Albertville. Although we had no idea who was inside (NBC Sports probably pays their speeding tickets), since we couldn’t catch them. We’re swearing that it was Bob Roll (who doesn’t love Bobke) in one with Paul Sherwin and Phil Liggett in the other. 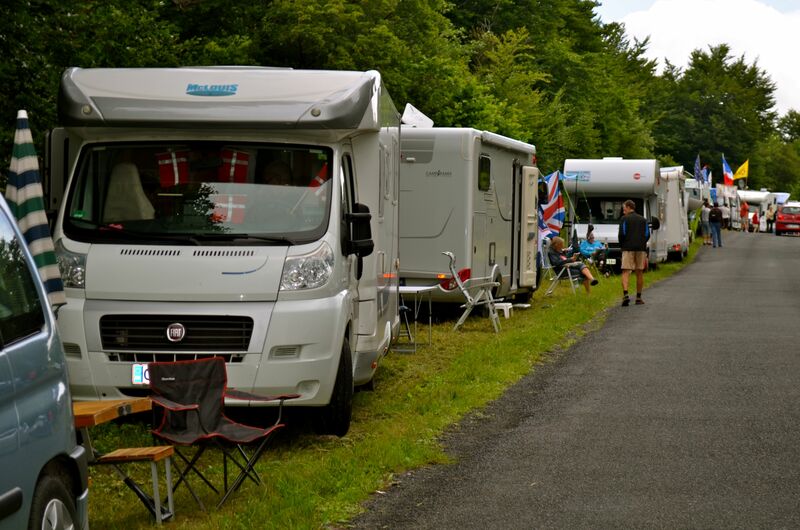 It was just amazing to think that caravans travel from distant countries to experience the Tour. 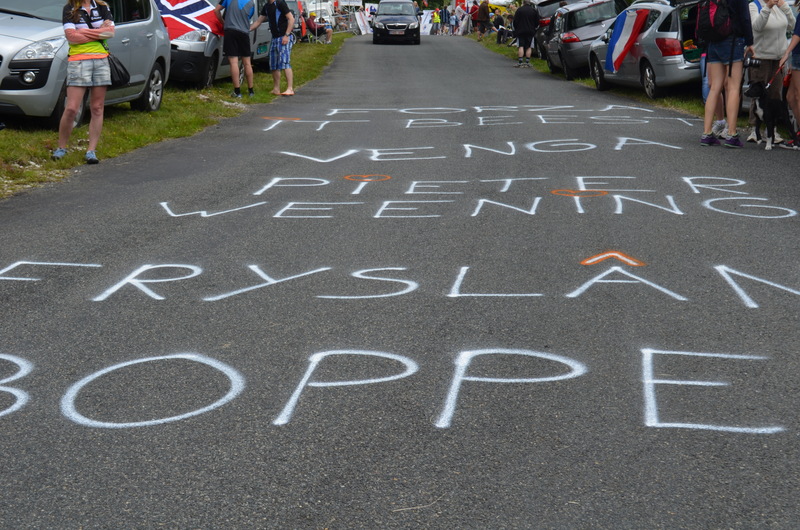 Observers spray paint the name of a relatively unknown cyclist from their region on the pavement. Some guy from a village in the Netherlands who drove a thousand miles and spray painted his countryman’s name on the mountain. He’ll be lucky to finish in 45th place. We have done the All-Start NASCAR race. While there is huge excitement and the fans are devoted, you have a drunken, often belligerent atmosphere. The most intoxicated people we met were some nationality censored who offered us beverages, told us some great stories and played us some great music. Rock on. 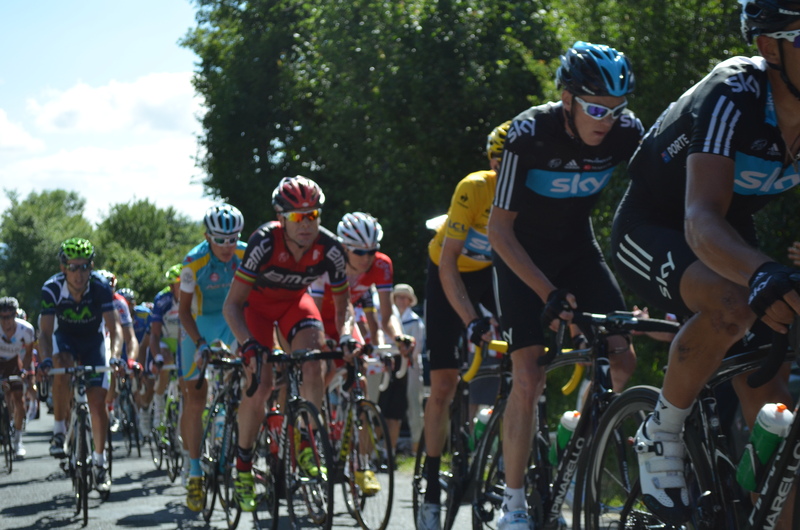 We saw last year’s winner Cadel Evans and Bradley Wiggens in the yellow jersey surrounded by team Sky. 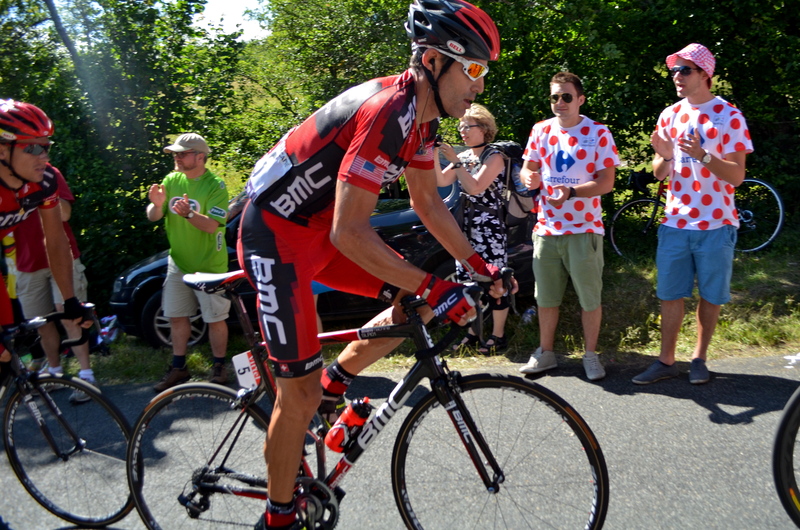 We saw all of our favorite American riders: Chris Horner, Levi Leipheimer, big George Hincapie, the hilarious Dave Zabriskie, Tyler Farrar, Christian Vande Velde, and the awesome Tejay Van Garderen (who should be BMC’s GC rider). 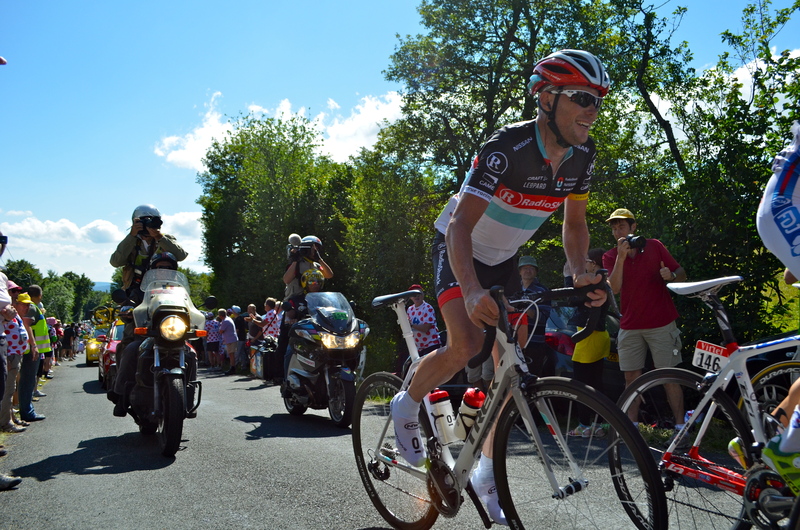 I even got to see some of my favorites: Frank Schleck and Fabian Cancellara. Even going uphill, they whipped by us at amazing speeds. I was still able to see enough to tell you ladies that Spartacus (aka Fabian Cancellara) is just as handsome in person. We finally got our bikes out of the our basement bomb shelter and went for a ride. The weather had been so nice, how could we not? Actually, we got them out a while ago, but I didn’t bring my camera along on that ride. This time, I was a little wiser. The good news is that we went for a bike ride, made it back in once piece and successfully investigated beaches for the summer. 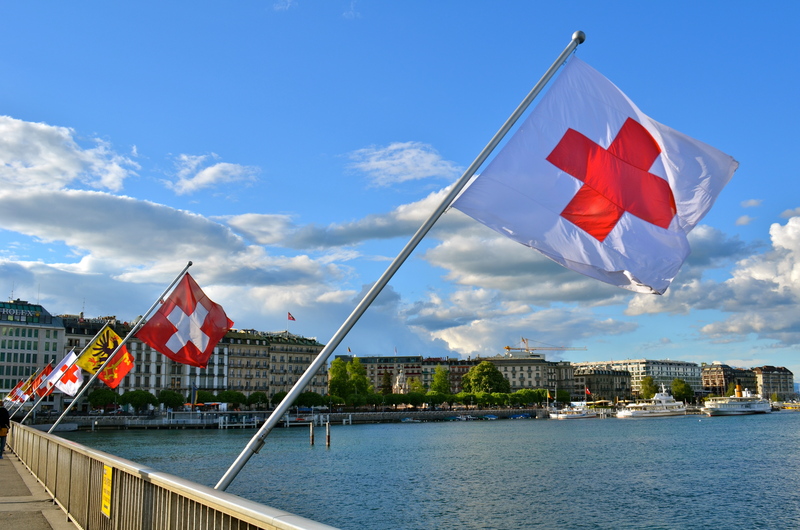 The bad news is that (a) Geneva isn’t flat, (b) we didn’t look take the weather into account, and (c) we didn’t bring our passports so we couldn’t go across into France. A team from Lake Geneva won the America’s Cup a few years ago. 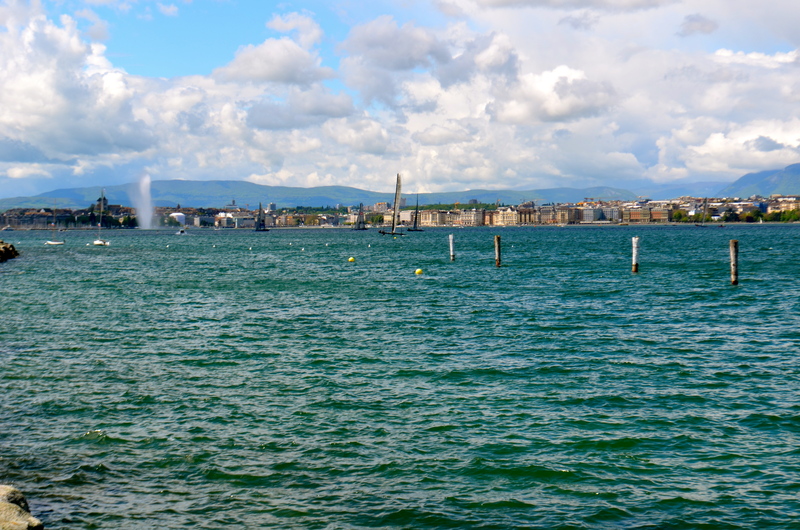 Seeing a sailing competition as we were heading out of Geneva should have been our first clue that it would be quite windy. Traffic wasn’t a problem. I wish we could say the same for the hills. 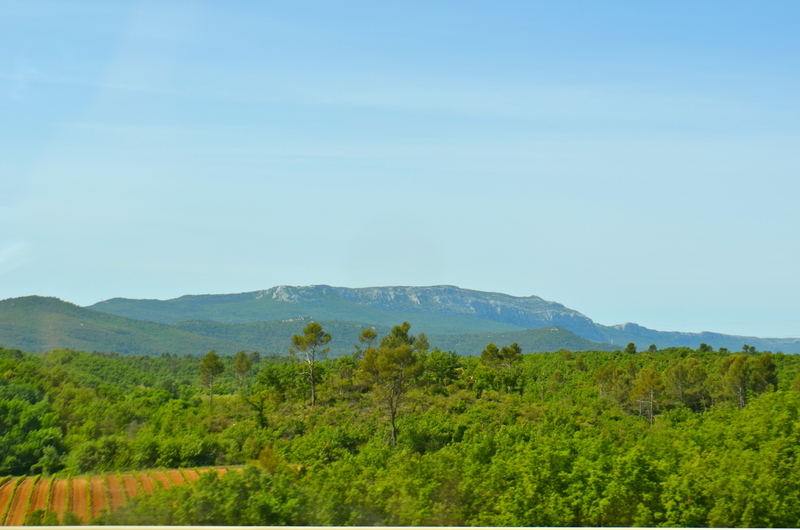 Living in Eaux-Vives, there is nowhere to go but up… literally. 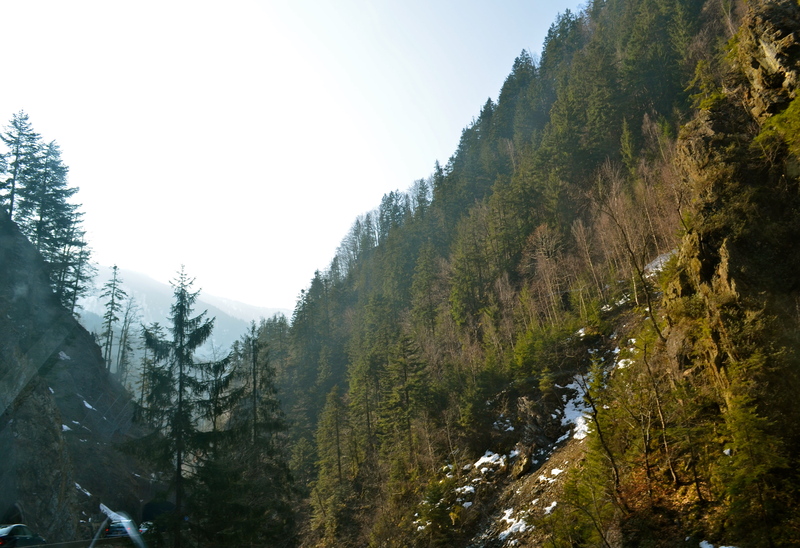 Switzerland isn’t flat and we can’t bike more than a kilometer without heading up a big hill (or two). A couple of years ago, we biked from Lisbon to Sagres and Sagres to Spain (with A2Z Adventures on a fantastic trip). Portugal isn’t flat either. Heading uphill on a bike on a sunny day, he had flashbacks. The morning of our ride, I took our visitors to the airport on the tram and squeezed in a quick 7 miles by running home. After breakfast, we decided to go for a bike ride. From our window, we couldn’t tell how windy it was. Heading up the lakeside to Hermance, we had a tailwind and didn’t really notice the wind’s strength. 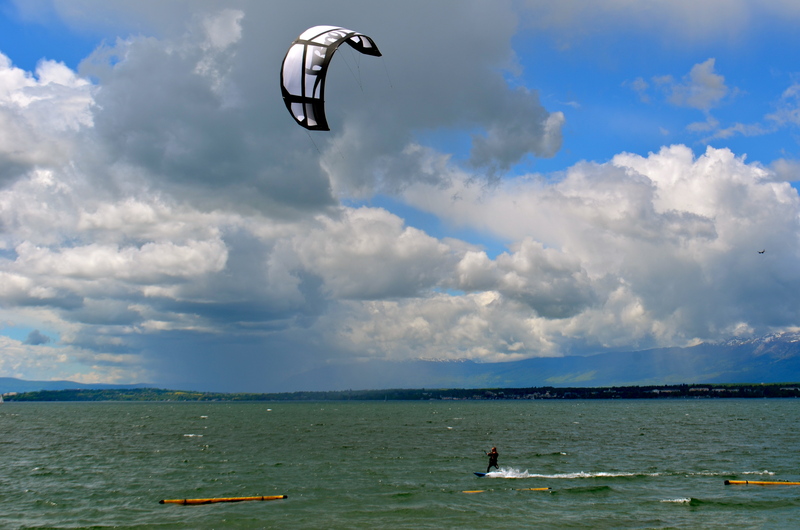 Even when we reached Hermance, and saw a kite surfer, we didn’t think about biking back in the wind. 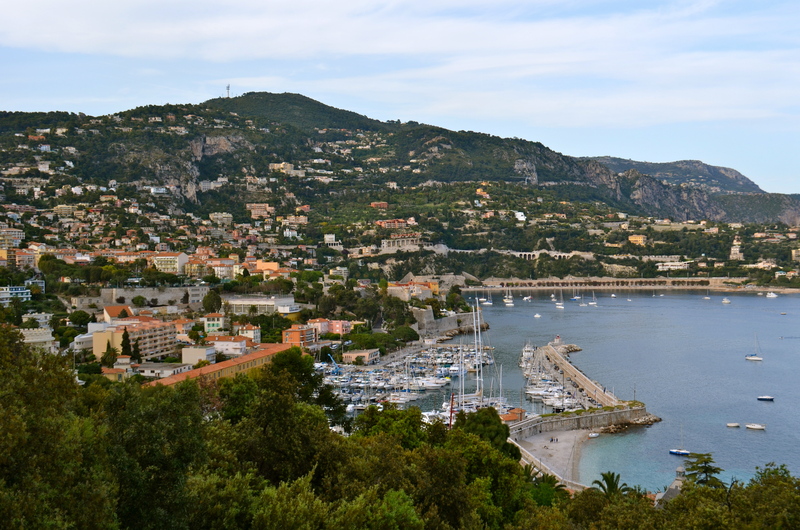 We checked out the Hermance‘s beach, did a tour of the cute town, and rode on to the border. 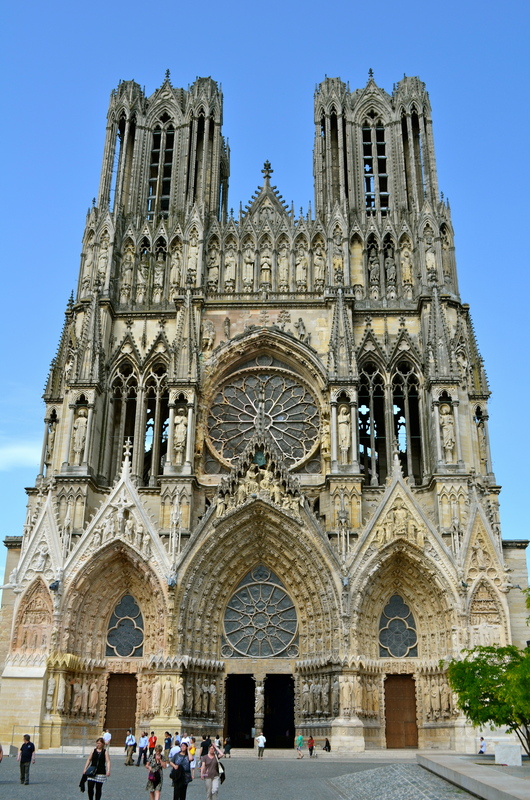 Unfortunately, we couldn’t go into France because we forgot to bring our passports. Ooops. 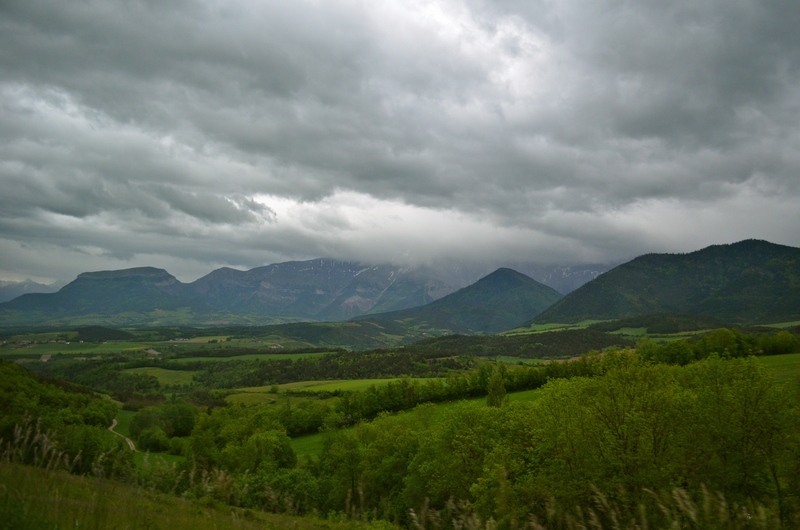 We rode back toward Geneva, straight into a headwind…the entire way. Even though we wanted to see more aggrestic splendor, I was pooped. How did I not notice the wind? There were signs. Flags, sailing competitions, kite surfing… How could I have been so blind. 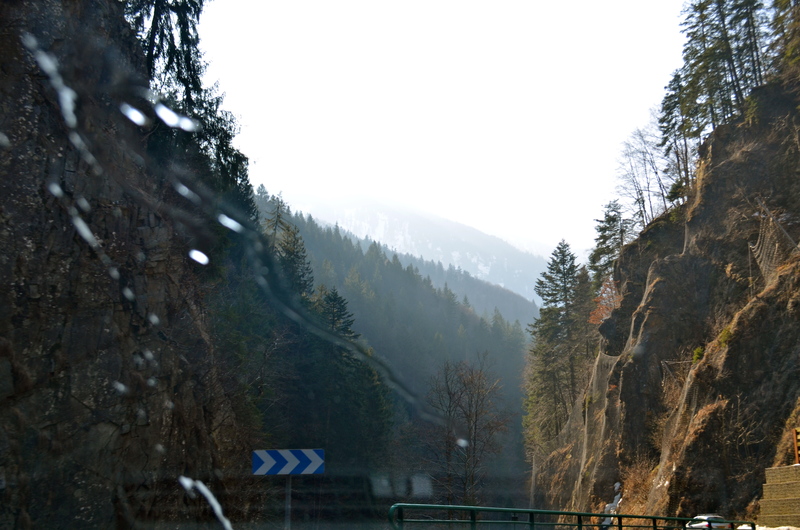 By the time we hit Geneva, my legs were burning and I was hungry enough to eat the back end out of a dead rhino. After we put our bikes away, we ate an insane amount of chocolate, collapsed on the couch and watched Top Gear. Despite our unpreparedness, it was a great ride. 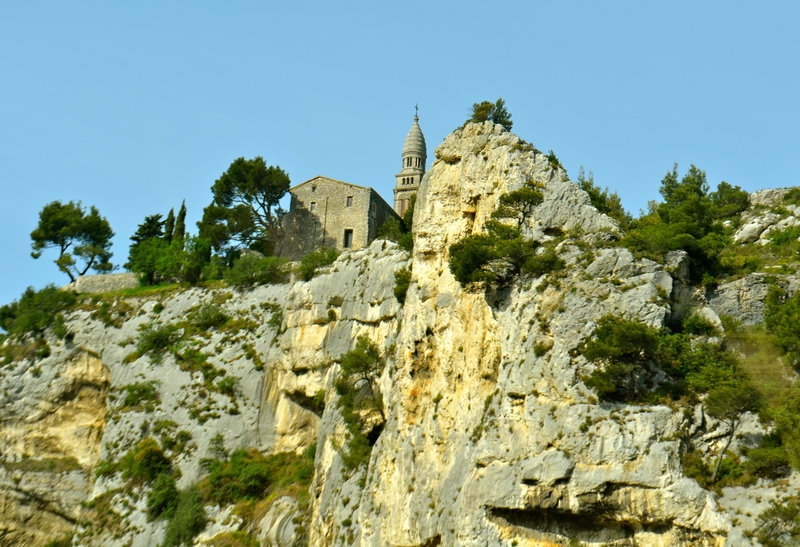 We saw here were amazing views of Lac Leman (Lake Geneva), the Alps and Mont Blanc. 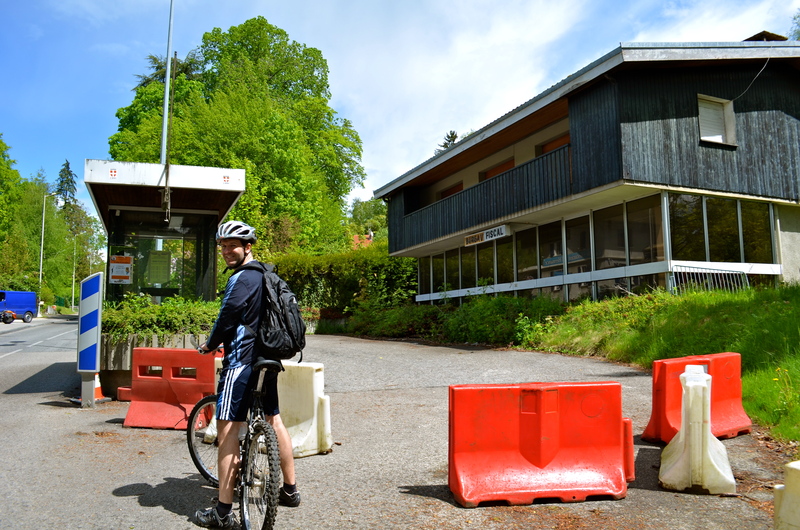 Switzerland is very cycle-friendly and we saw tons of other bikers. Cars were considerate and seemed used to cyclists. Unlike cycling in North and South Carolina, we weren’t honked at a single time! Indiscriminate honking is frowned upon here as it may disturb others, definitely a cultural difference. I like to ride a bike. 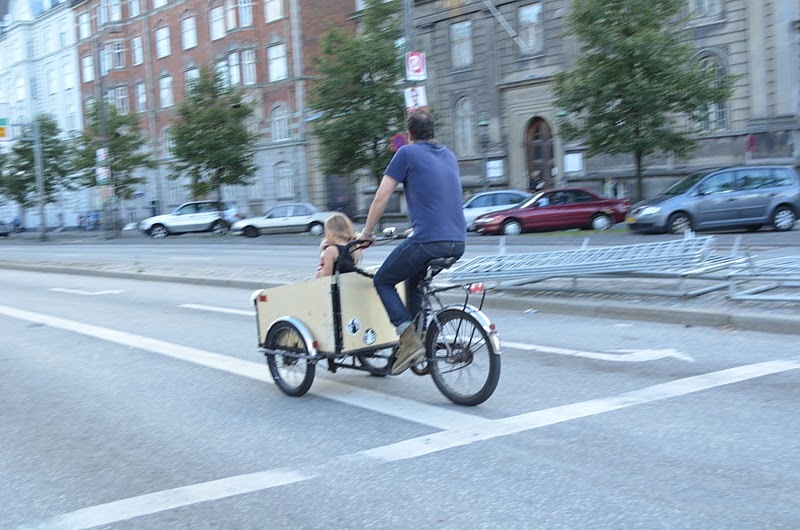 For the Danes it is an integral part of their day and culture. 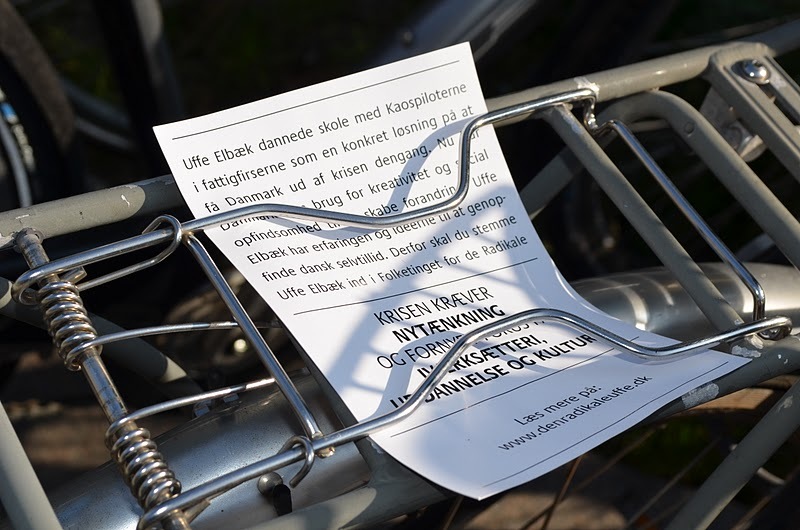 The Danish government taxes cars at 180%! Yes, you read that correctly. 180%! Read it and weep Detroit. 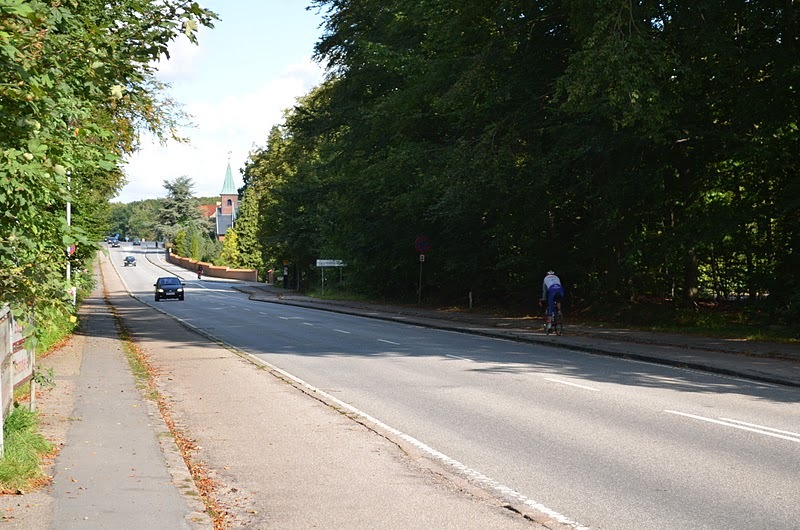 I took lots of pictures to show how it is such a bike friendly place. 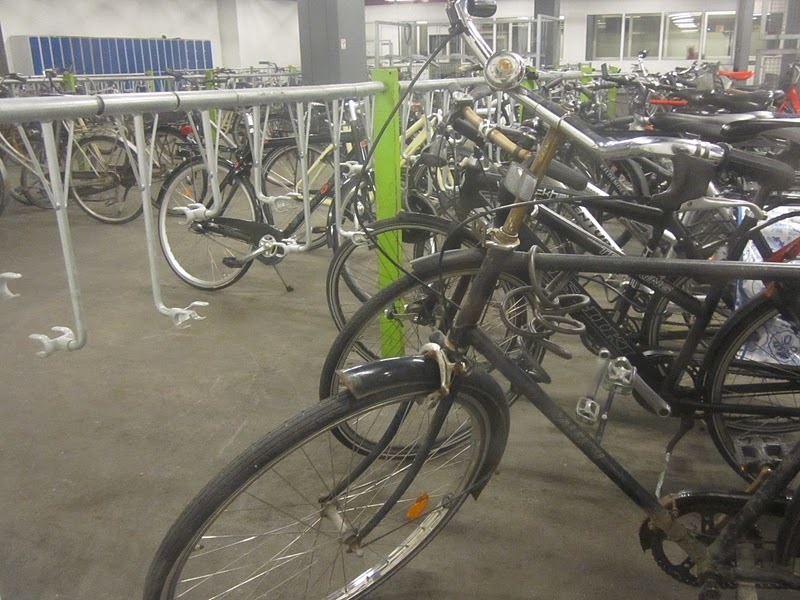 They have plenty of parking for bikes…and then some. Seriously, there are tons of them. This is only a small bit of an indoor bike storage room. I’ve seen businessess (and apartment complexes for that matter) in the US with parking lots that were smaller. 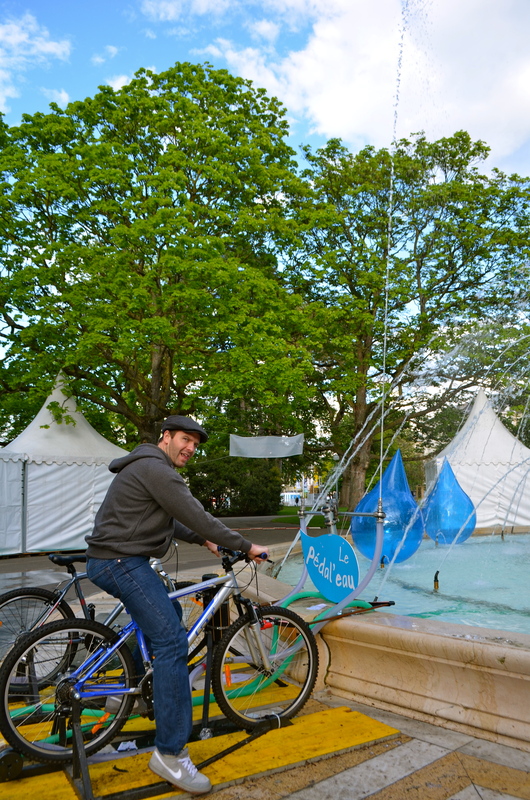 They make it easy to navigate the city by bike. 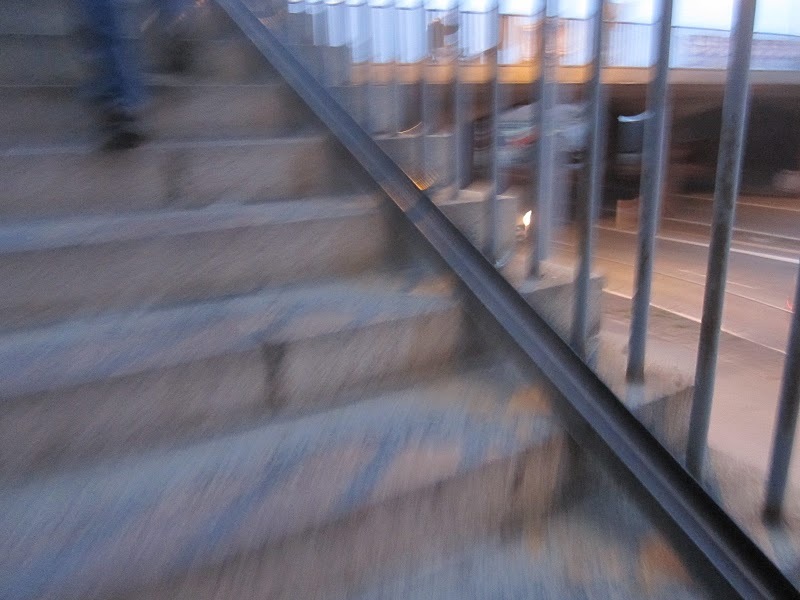 The stairs have a rails to roll your bike up or down. The bike lanes are everywhere and are huge. 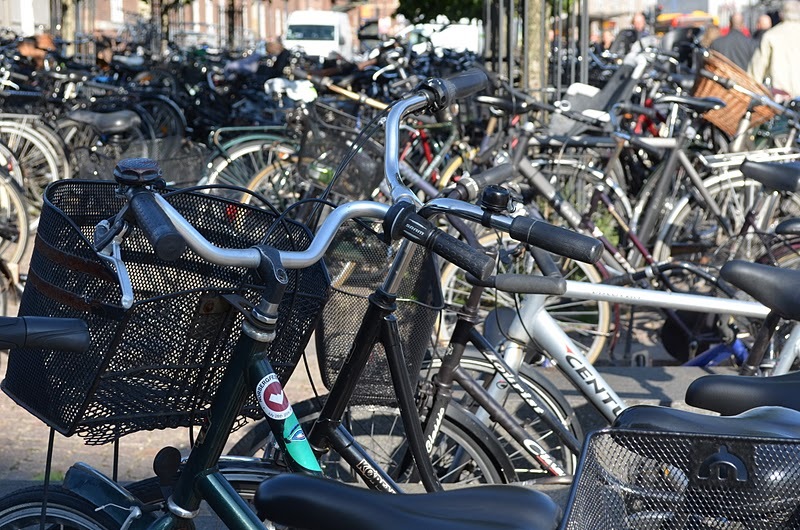 I heard (so who knows whether it is true) that to eliminate some of the crowding on bikes during rush hour, they were considering closing parts of the city to car traffic to make more bike lanes! 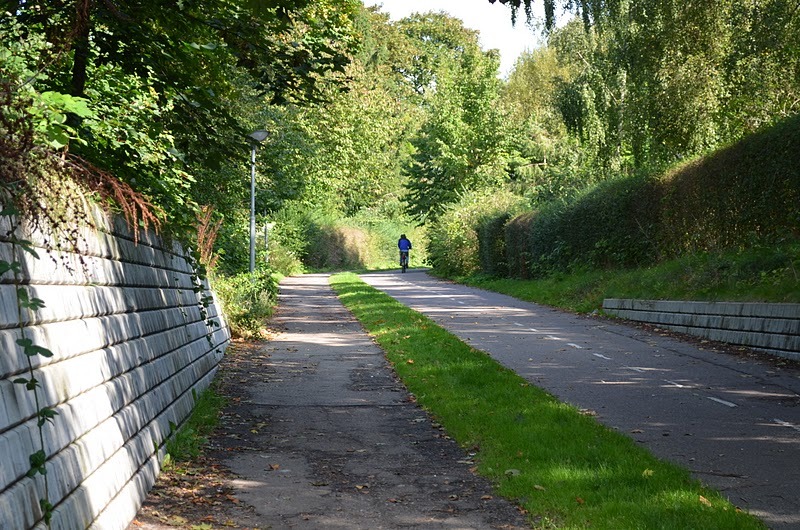 Cars have to take the long way around, you can take the shortcut by bike. 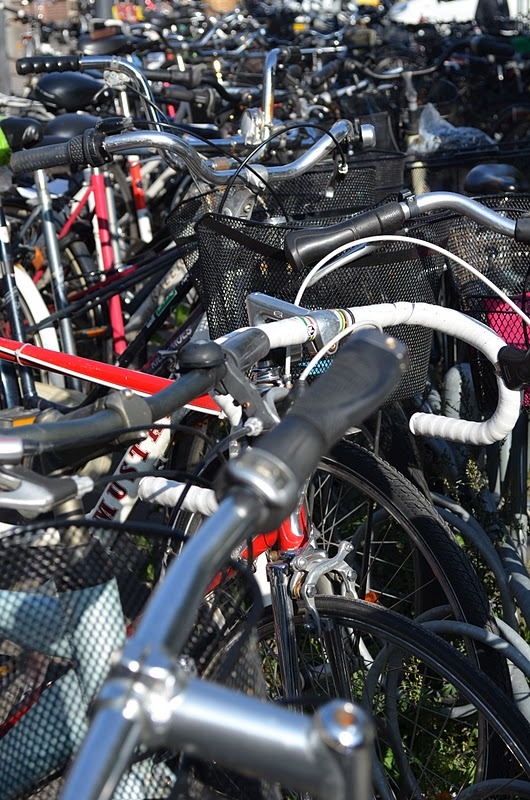 People are prepared and trick their bikes out to fit their needs. This guy was toteing three little ones around. We also saw people using those to transport their shopping. Two kids and a baby an infant carrier up front! The bikes even get ads, like we do on our windshields. 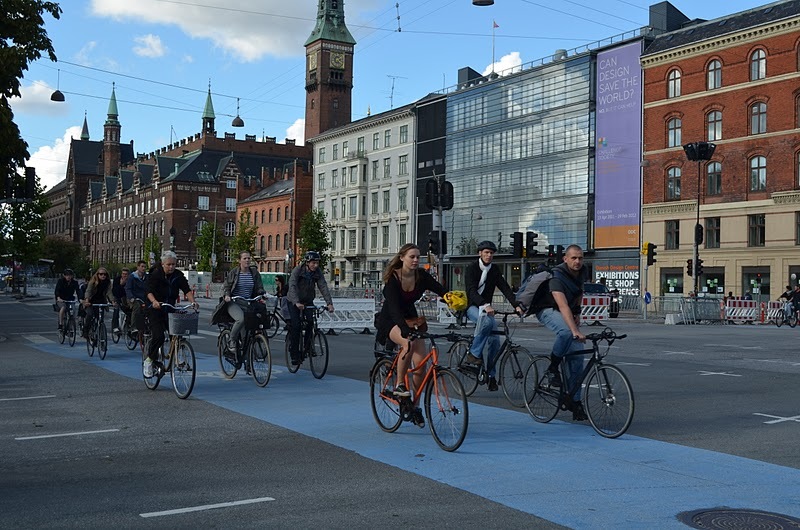 By the way, the cycling world championships were held in Copenhagen this week. Despite trying to talk my way onto the Leopard Trek bus, this is as close as I made it. My boy, the Swiss Fabulous Fabian Cancellara (aka Spartacus), came in third (Congratulations on the podium finish). Has anyone seen Fanboys? This is my cycling version of it. His helmet? Please don’t take out a restraining order.